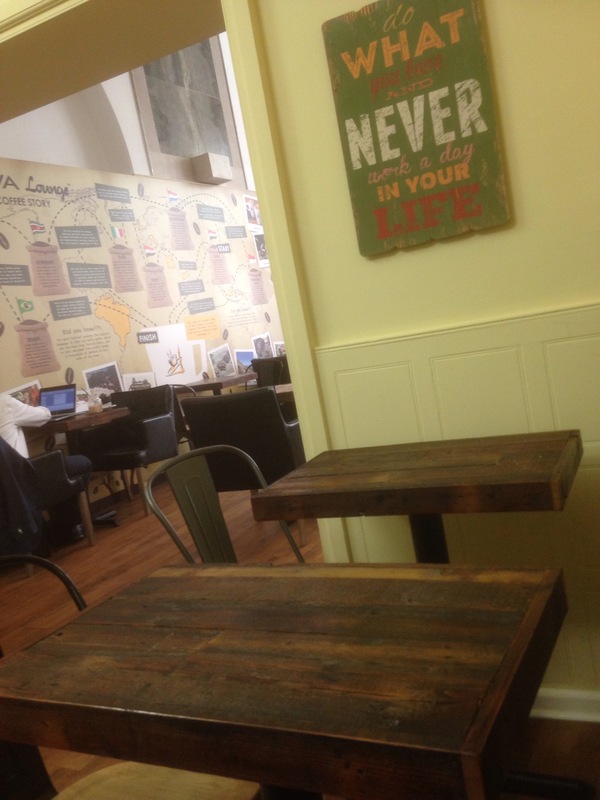 Coffee time @ Vegan and Vegetarian 3 Three’s Coffee Lounge, Birmingham City Centre. 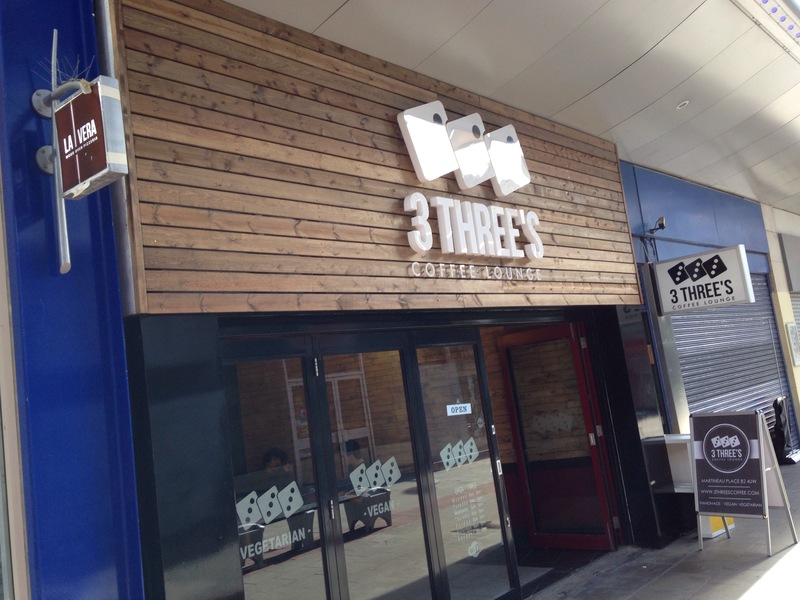 3 Three’s Coffee Lounge is a new Vegan and Vegetarian coffee shop in Martineu Place, Birmingham City Centre. 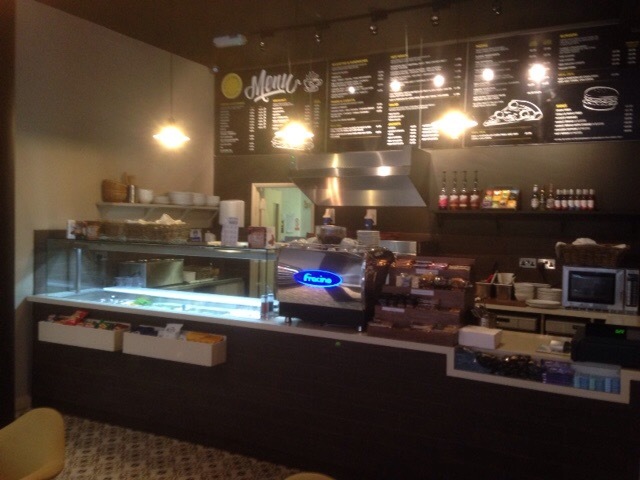 Recently opened it offers a mixture of hot ( soup, vegan hot dogs) and cold food (Sandwiches, cakes, ice cream- 12 flavours, 4 vegan friendly) and of course coffee. All cakes are also Vegan friendly and dairy free. 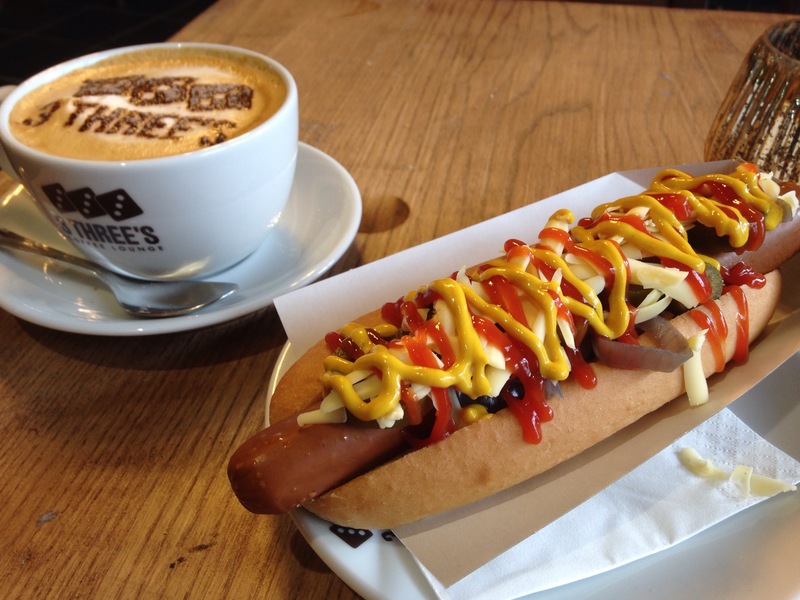 Most of the menu it seems is suitable for Vegans and offers mock meat style options (sandwiches, wraps) as well non meat style options such as hummus, avocados and roasted peppers and the soup and hot dog (Frankfurter) is dairy free. 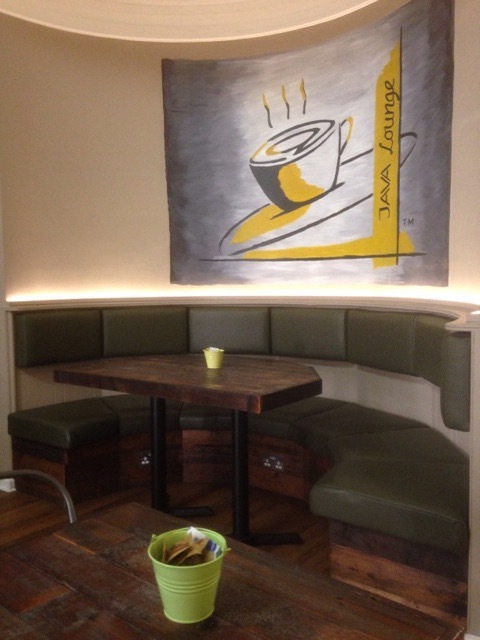 3 Three’s has an informal and comfortabl feel with good reliable Wi Fi and sturdy wooden tables, ideal for working on. It’s quite a large space with plenty of seating and art work on the walls. 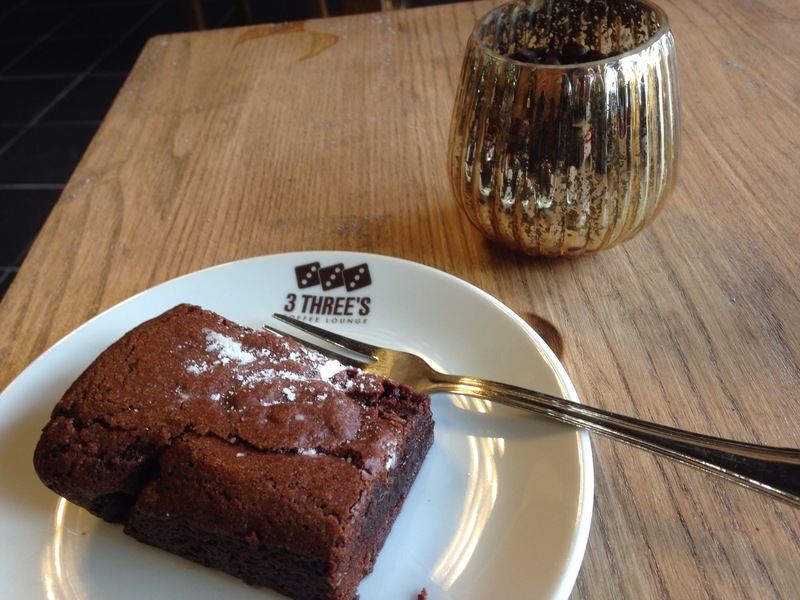 3 Three’s also had a nice atmosphere, with good background music. On the two occasions that I’ve been it was busy considering it had only been open a few days and word of mouth seems to be getting round. 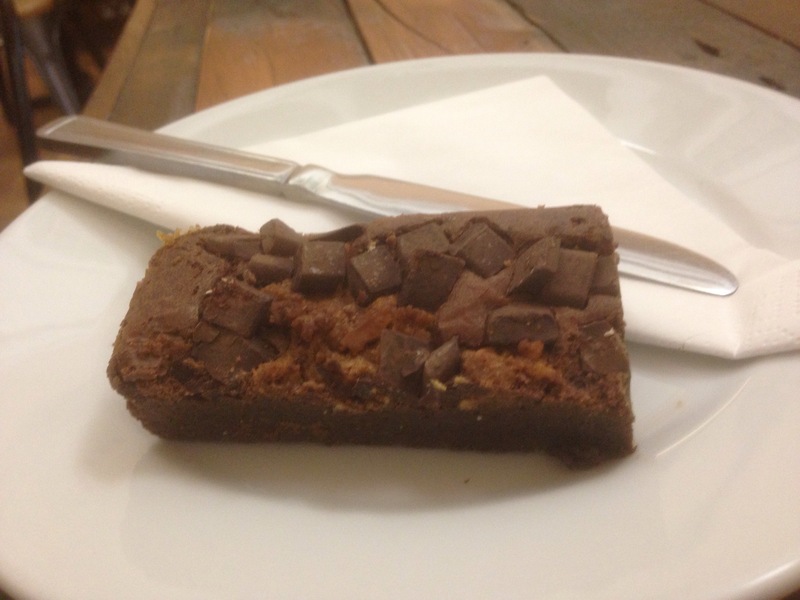 On my first visit I enjoyed a Chocolate Brownie (£2.20) that had an excellent chocolatey flavour, was nice and gooey in the middle, a good flat shape and had a homemade feel about it. It was a pleasure to eat and very tempting to repeat. My Flat White had a good espresso coffee flavour, though lacked the micro foam swirl of others in the city that makes it so distinctive, it was a bit of a disappointment though had a decent full flavour. I’m sure this will improve. Mine was made with semi skimmed milk, there are non dairy versions available with Soya or Almond milk. Chocolate Brownie. All cakes are vegan friendly. 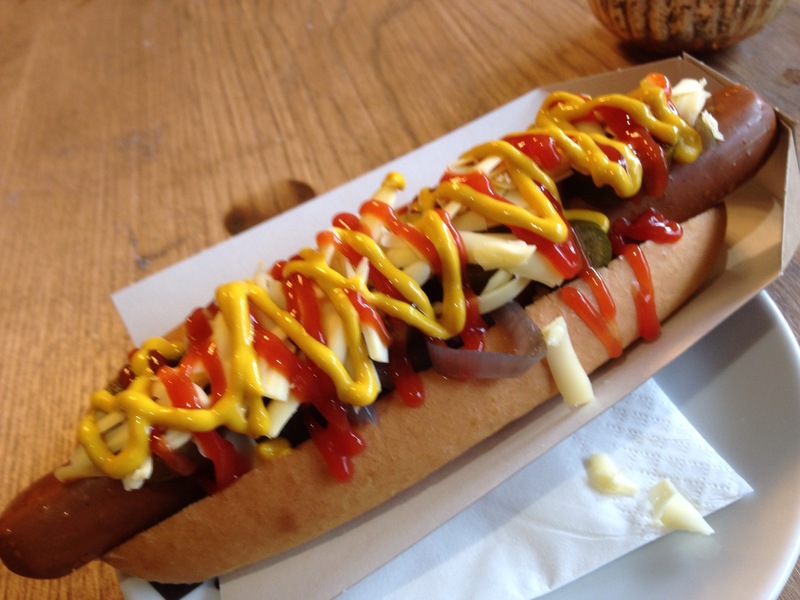 On my second visit I tried the Vegan friendly Frankfurter Hot Dog £3.00. Served in a 8.5 inch white roll, the Frankfurter hot dog made out of tofu? I think, came with a choice of toppings, jalapeños, mustard, ketchup, and onion with salsa to be launched soon. It looked stunning and tasted exceptionally good. 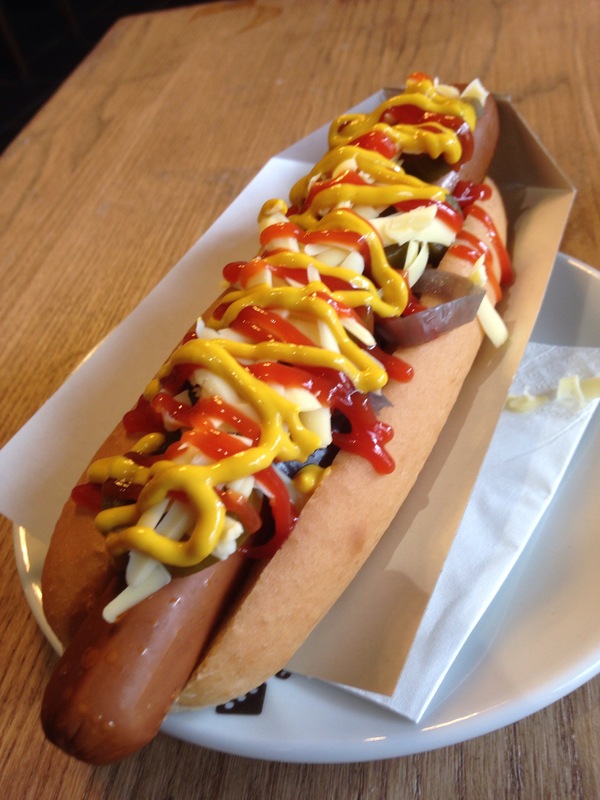 The Frankfurter was full of tofu flavour, and set off by the spicy jalapeños and soft silky onions and bright and vividly flavoured mustard was one of the nicest of it’s kind I’ve tasted for ages. 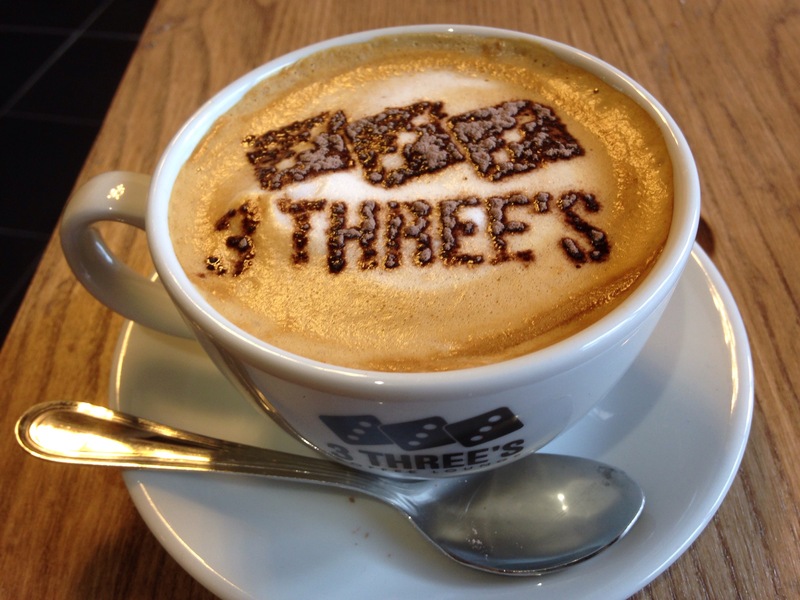 I also enjoyed a semi skimmed Cappuccino ( £2.50) that had a nice strong coffee flavour and had a lovely arty chocolate 3 Three’s logo on top. 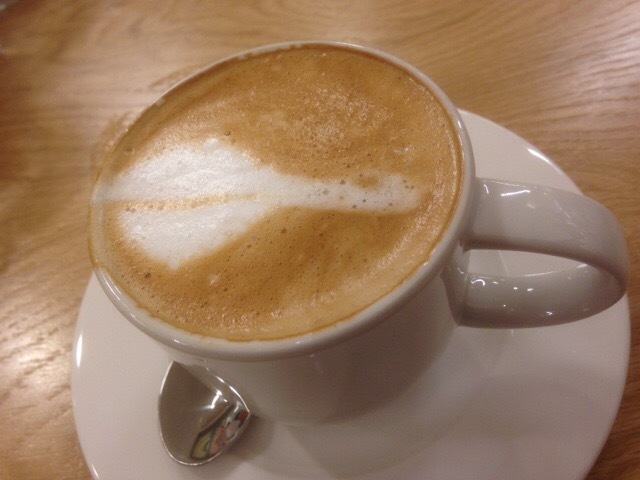 A great coffee. Before now the brilliant Warehouse Cafe was the only informal veggie and vegan eating place in the city centre, but not a coffee lounge in any form. 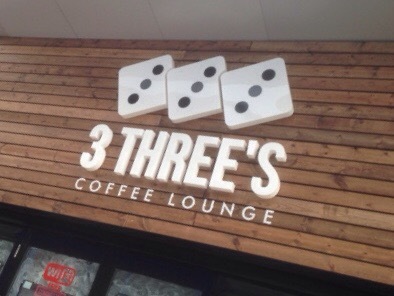 3 Three’s is going in a different direction. It’s very much needed and in a decent central location with lots of foot traffic. 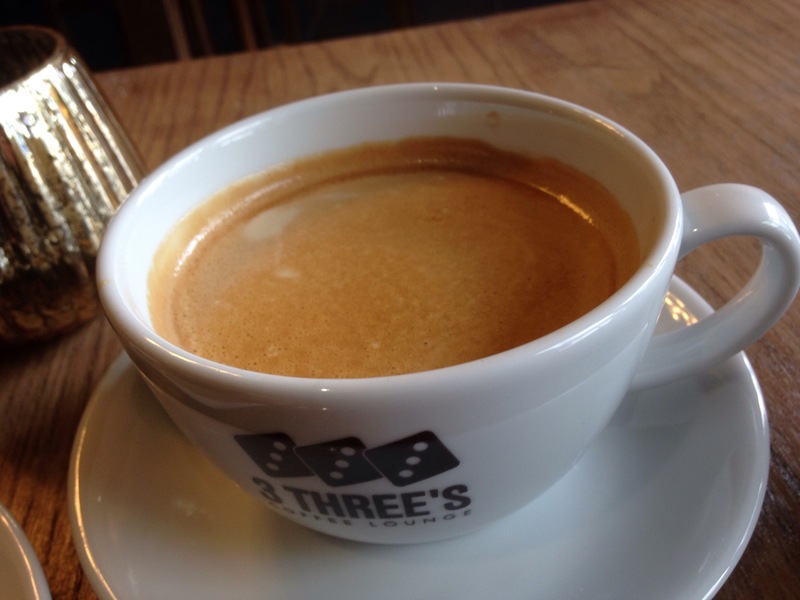 As a first look, I was very impressed with 3 Three’s Coffee Lounge. 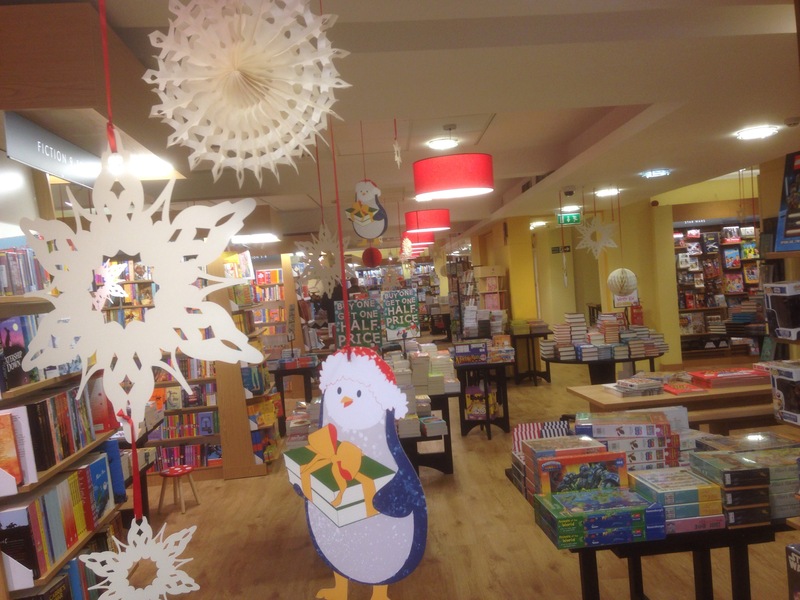 It’s a very friendly shop, wih staff that are enthusiastic and keen to please. 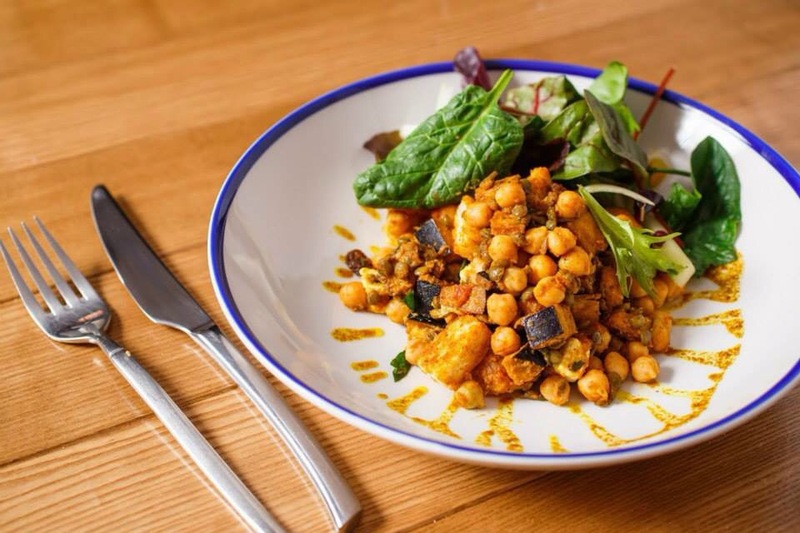 The food I’ve eaten is of a high standard and the menu though limited so far, is nice and catering to an informal laid back crowd who want something different and find the indulgence of a Vegan/Veggie or Gluten Free friendly atmosphere to their liking. I’d like to see more risks in time with some of the food. I know this is in hand and the menu is constantly under development. A few salads, raw maybe using seasonal vegetables, breakfast items, a bit more simple hot food, perhaps burrito’s, even a burger. 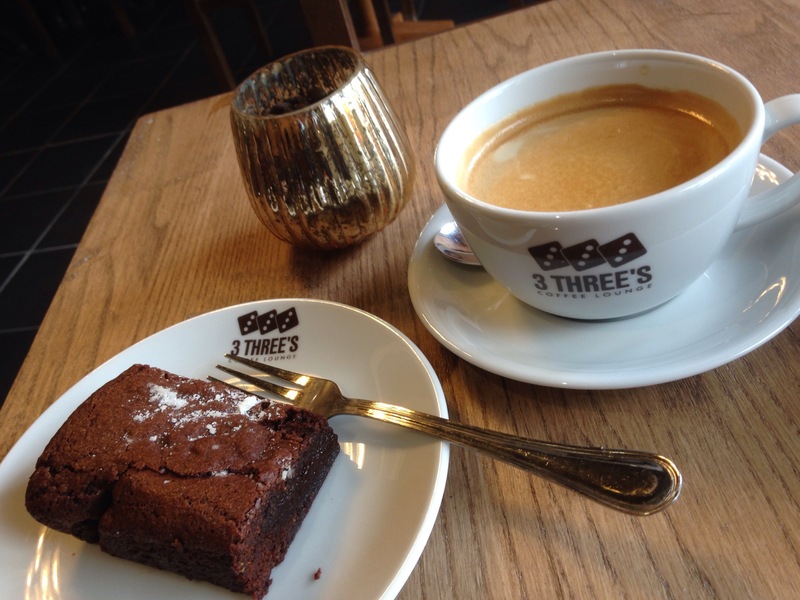 These though are only my perceptions of an informal vegan/veggie space, from ones I’ve visited in London for example, not the definitive, but for now 3 Three’s is an improvement and an asset to Birmingham’s developing independent cafe and coffee scene and offers something different with quality for us non meat and fish (and dairy) eaters, (in fact the whole of Birmingham.) it’s a place I’ve warmed to and a place I will frequent often. Any new venture of this kind deserves support and is a positive start in creating a more defined informal Vegetarian and Vegan lunch stop in central Birmingham and this is most welcome. 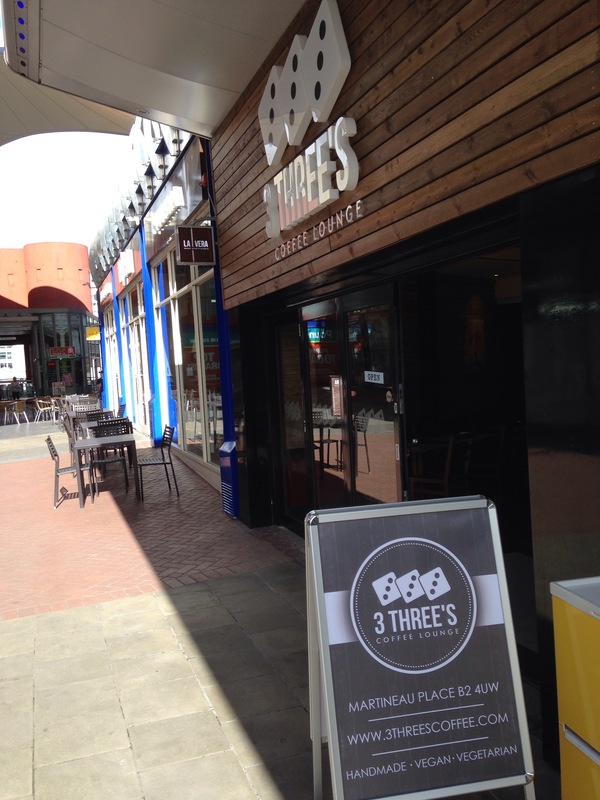 3 Three’s Coffee Lounge, Martineau Place, City Centre, B2 4UW. I paid for all my food and drink in full, my opinions are my own and honest as always. 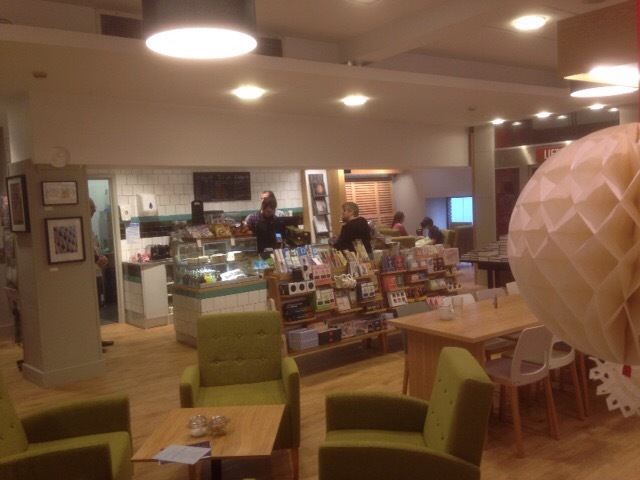 #Coffeetime: Waterstone’s independent cafe Birmingham. 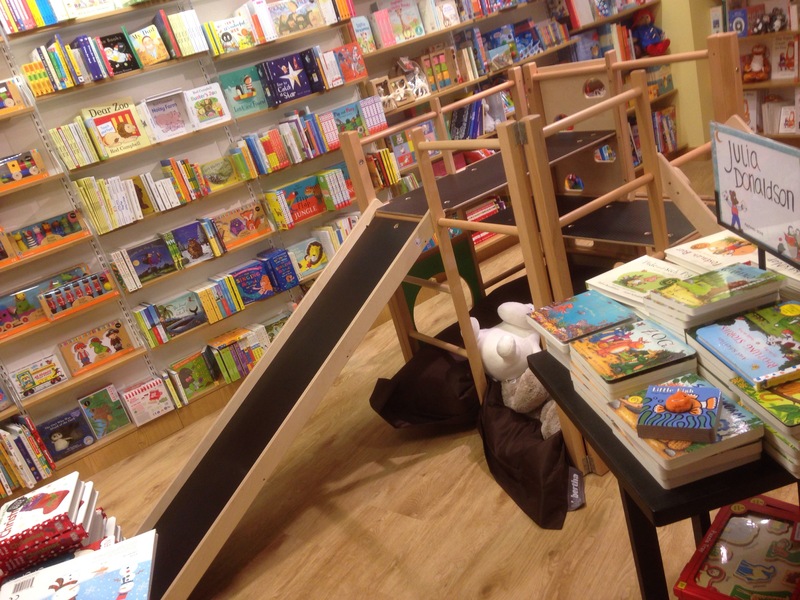 Now books, that’s another story. I’m always to be found with a book in my hand, whether fiction, poetry, gardening or art, I’m never far from one. 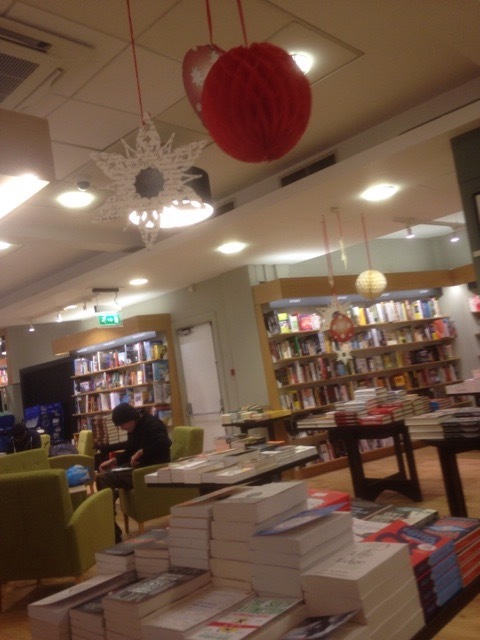 In fact I’ve been known to spend a few hours in book shops and thus if in Birmingham Waterstone’s is the main and largest book shop in town to visit. 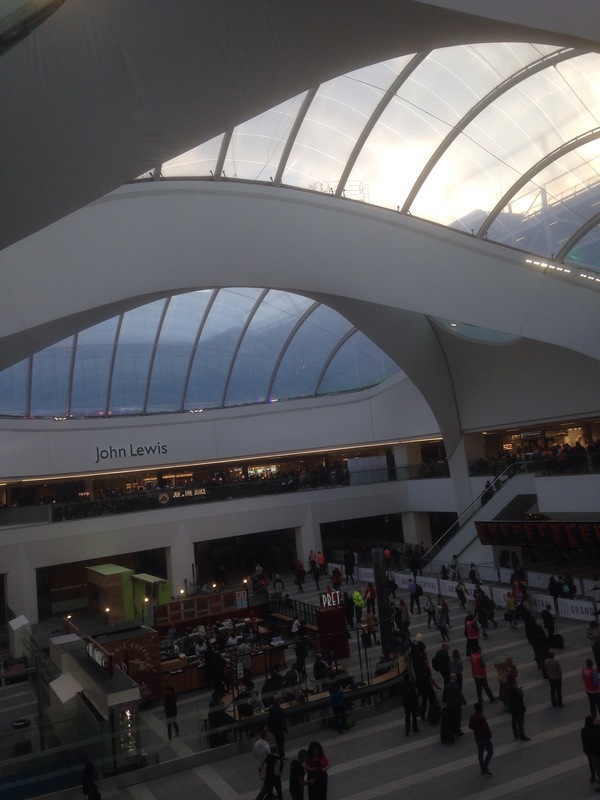 The new impressive Waterstone’s Birmingham on High Street on the Bull Ring intersection is huge. 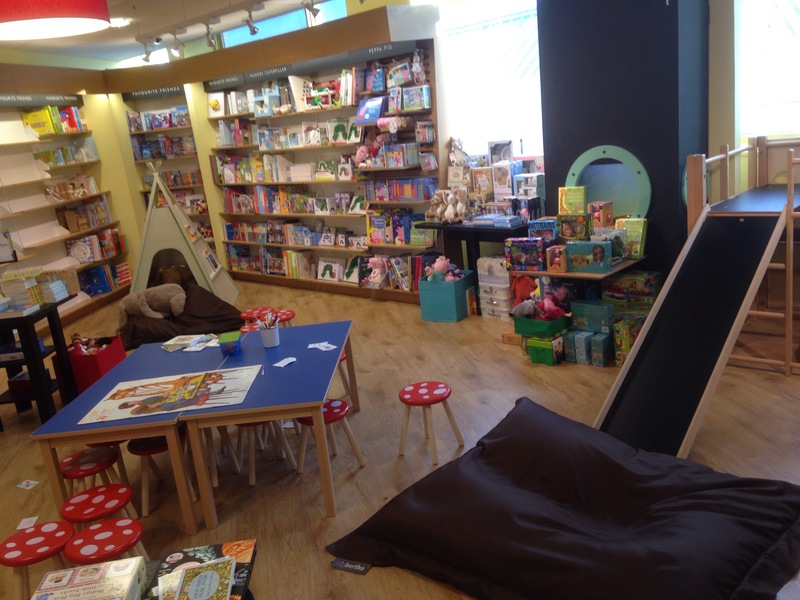 Covering five floors, it covers every type of book and has a lovely floor for its Children’s section which also has its own cafe and cup cake making sessions (plus children’s play area). 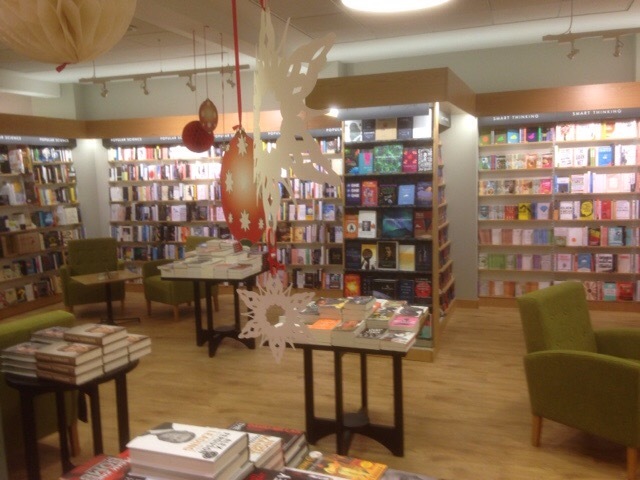 Created as a ‘flagship bookshop for the Midlands’. 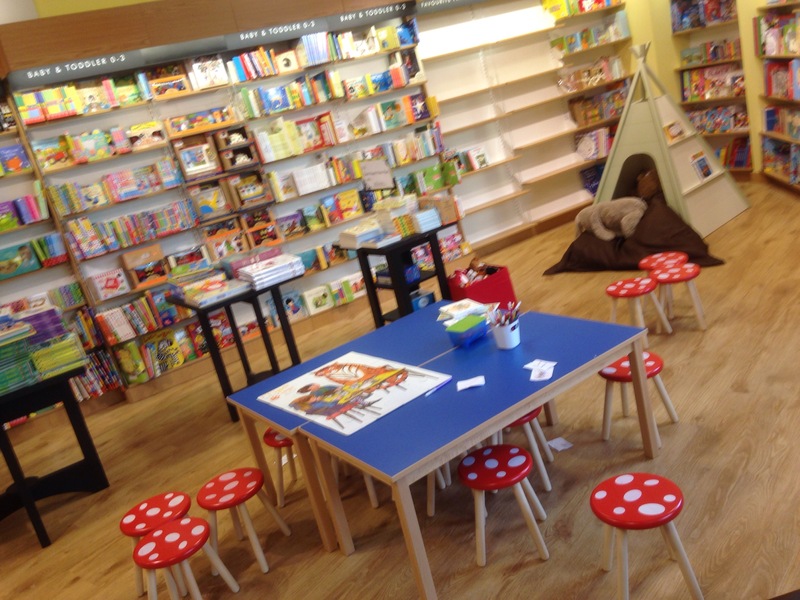 The fiction section has its own floor (basement) and there are oak bookcases fitted throughout. Topped with this there’s also a varied events programme (see in store or on the website) and the shop itself feels more engaging, more user friendly with a new shop front and enhanced book range (though the poetry section is still a bit small for me). 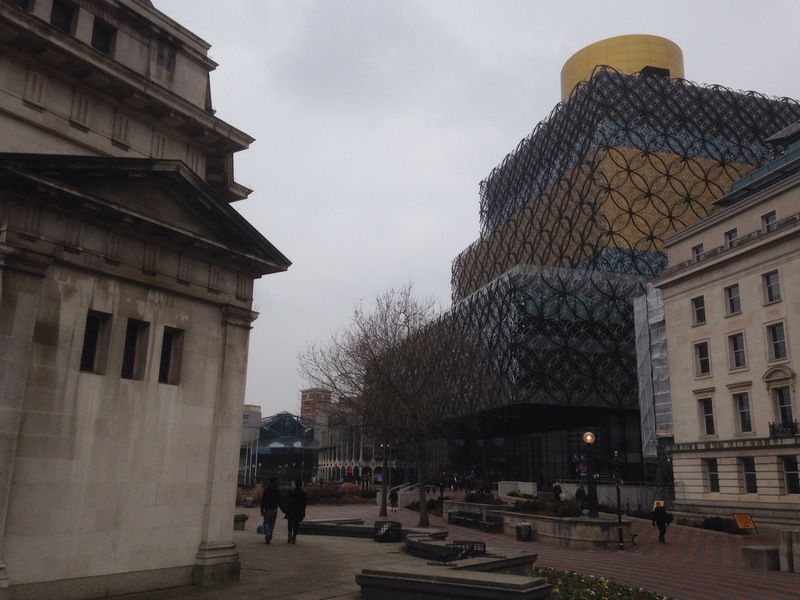 It’s a joy to walk around and another step on the revolutionisation of Birmingham as a cultural city merging with an impressive and vibrant city centre. Now it appears that me and Mrs Mills’ cakes have a thing going on, but just keep it a secret, but then I’m bound by been a blogger and all food consumed is ‘for the blog’ and the blog alone. Ruth my wife disputes this, and feels that I just consume food, well because I like it. It’s probably one of the reasons why I began my blog. 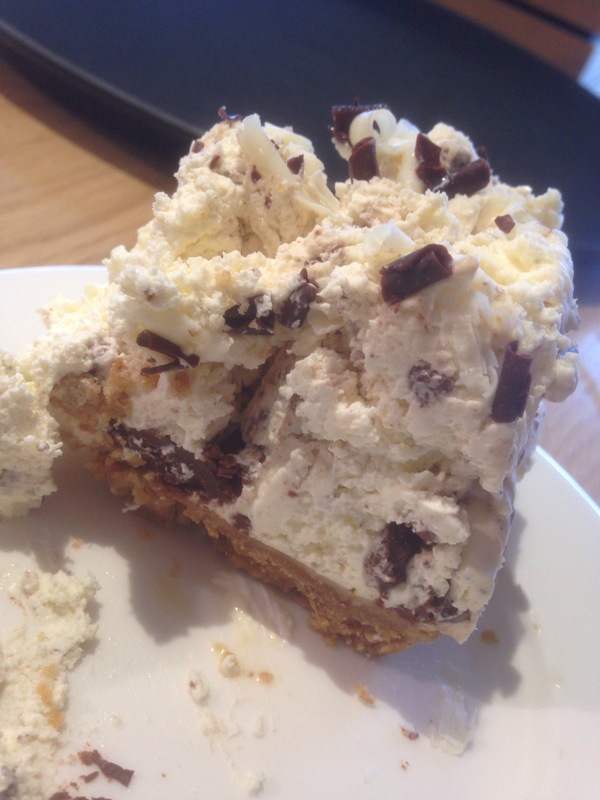 As, what’s the point in being a food blogger if you don’t like food, and cake is food…right. 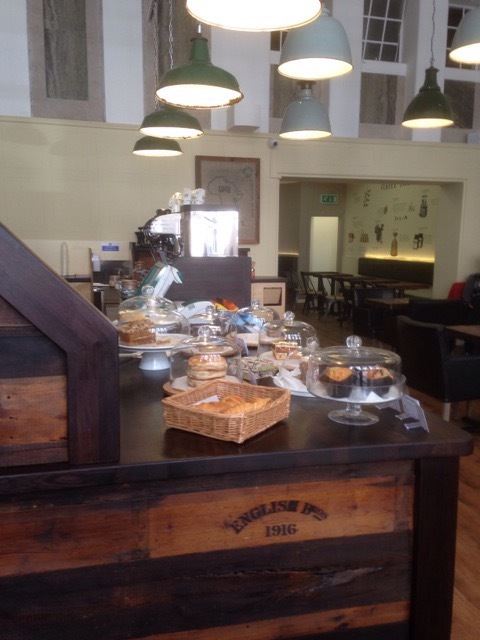 The cafe is run independently and this shows in its free and easy layout and atmosphere with comfortable seating throughout. It’s a peaceful spot, but there is a surprise that you can sit on any floor with your drink and food if you wish (as long as you don’t mind carrying it up flights of stairs). 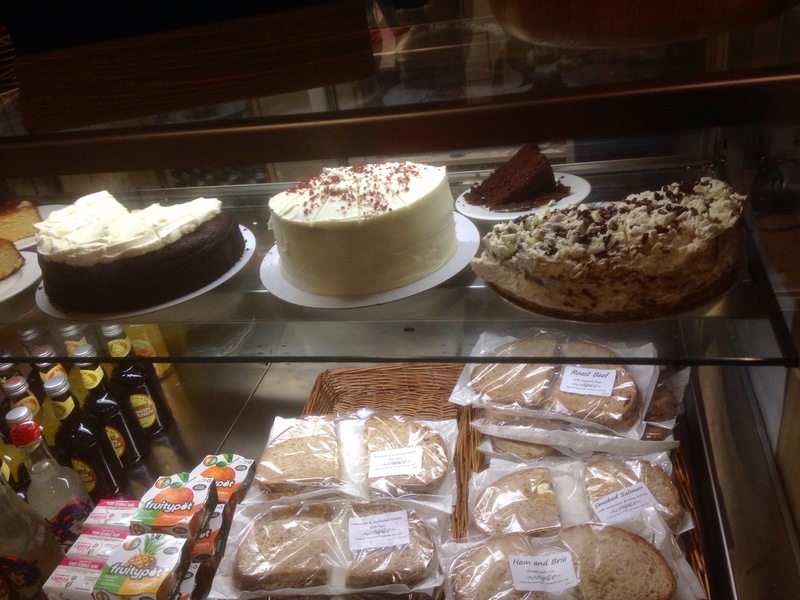 The aim is as much as possible to use local producers for cakes and bakes such as Mrs Mills. Creamy chocolatey layers of delight. Cheese cake base well made, a good bake. Rich Vanilla pod infused with a thick swirl of dark chocolate running through each slice, chocolate chip pieces. Melt in the mouth deliciousness. Indeed the best cheese cake in Birmingham no doubt. Eaten with a lovely flat white. In fact everything one should be. Velvet micro foam and a powerful double shot of coffee. Mrs Mills’ Chocolate Brownie (with Pips Hot chilli sauce). 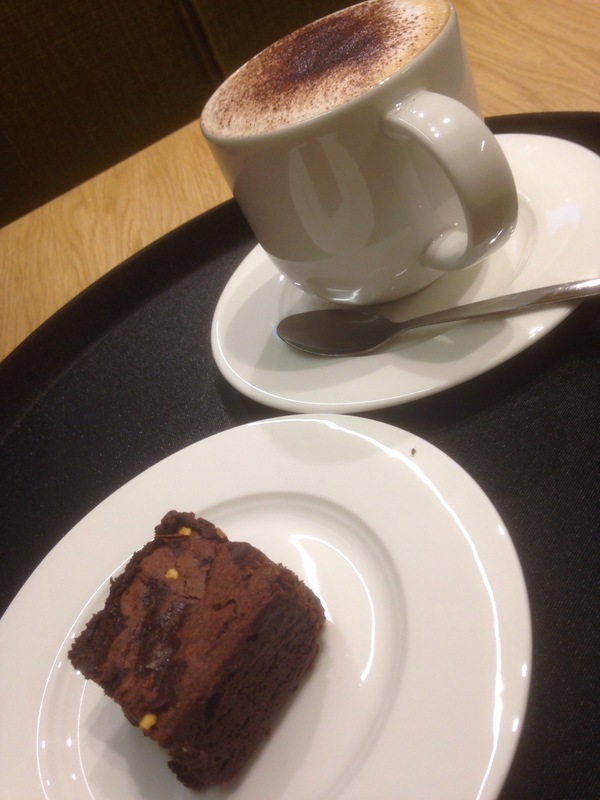 The second cake I’ve eaten at Waterstone’s cafe is the Chocolate Brownie made with Pips Hot Chilli Sauce and sea salt. 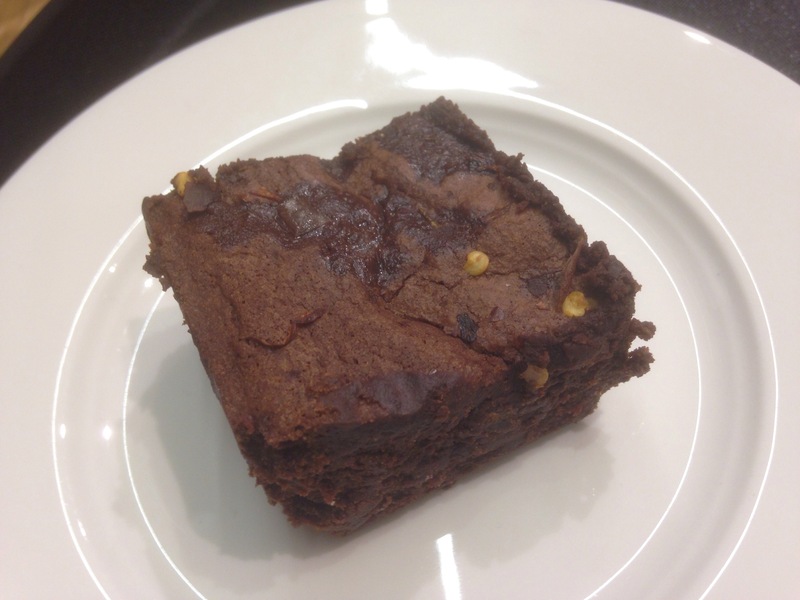 A luxurious brownie, with a definite chilli hit, which though quite powerful compliments the gooey chocolate well and makes for an indulgent treat at any time of the day. 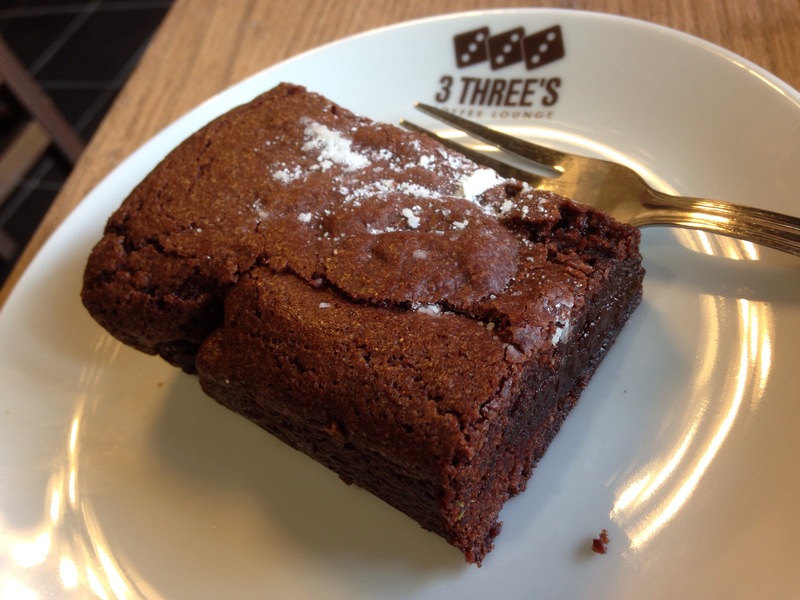 A very beautiful brownie that deserves repeated trials. A treat. 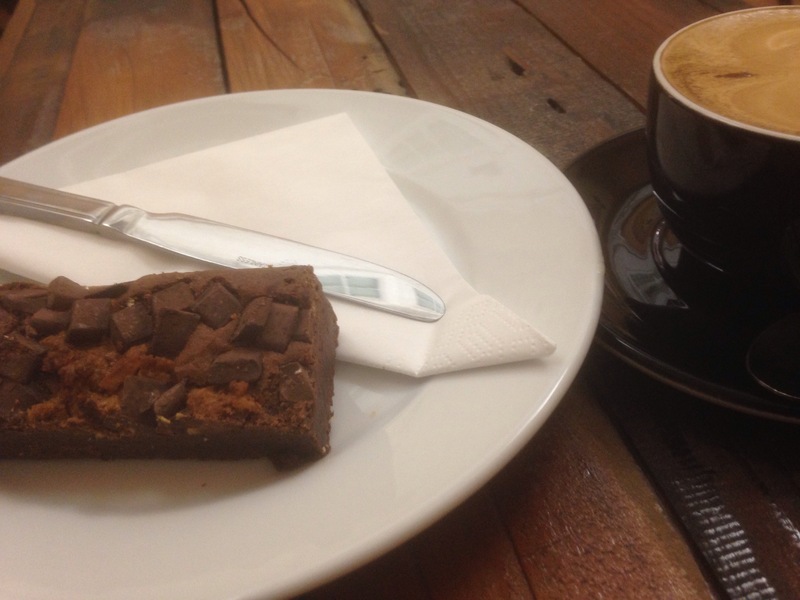 Eaten with a disappointing cappuccino which wasn’t intensive enough in coffee for me and felt quite flat next to the brownie. Shame. 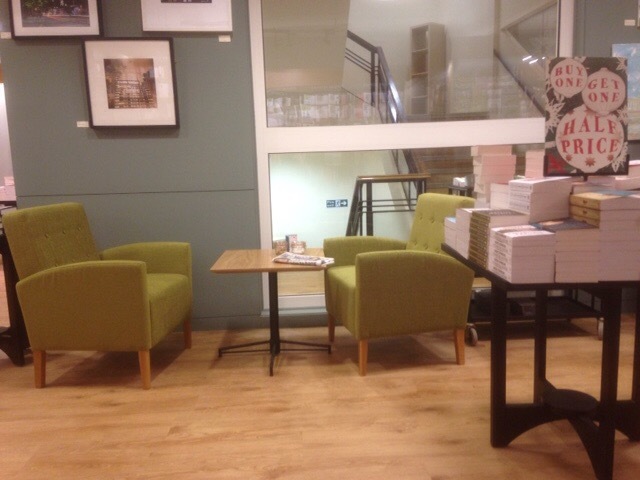 Waterstone’s cafe also serve sandwiches and biscuits. 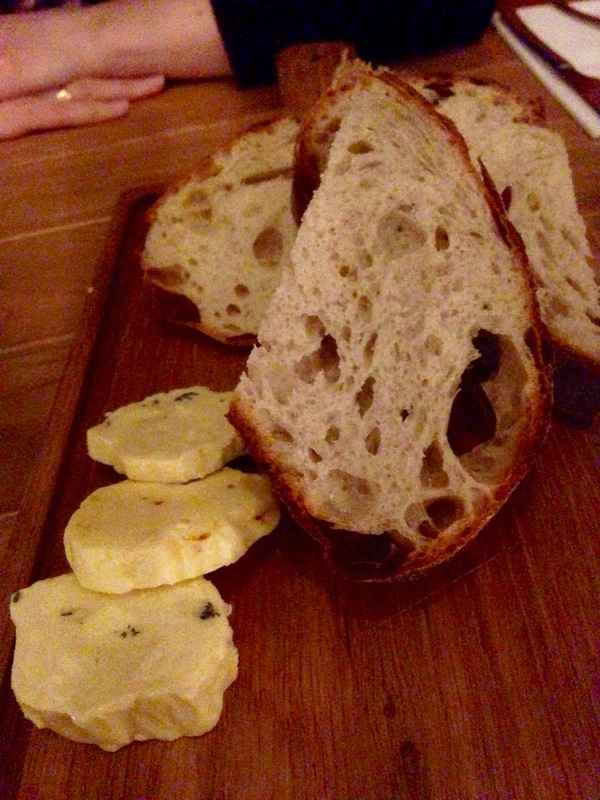 Bread is provided by local artisan baker Peel and Stone from the Jewellery Quarter. Other local producers are Anderson and Hill and Too busy to bake. 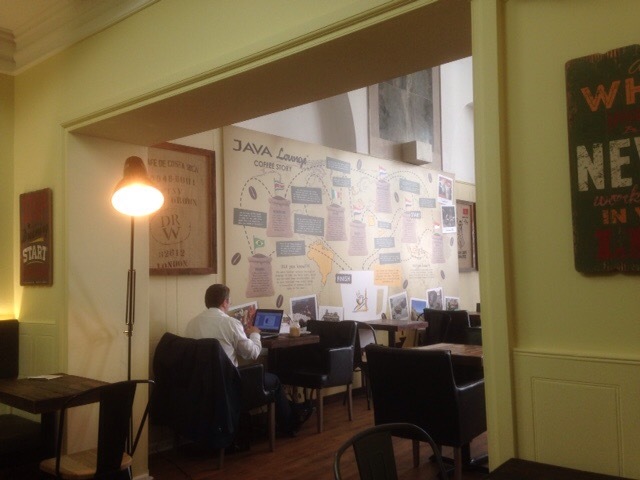 It’s a delight in every way and a place to wile away the time, but beware if you fancy working there, their wifi is erratic and tempermental, in fact much like writers. A match made in bookish heaven. 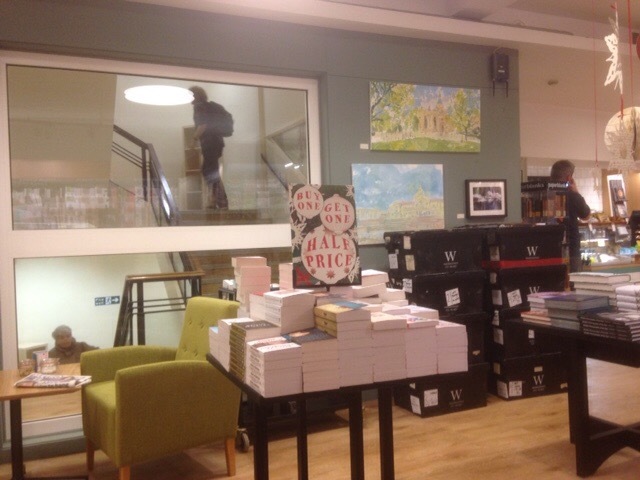 Cakes and sandwiches at Waterstone’s. 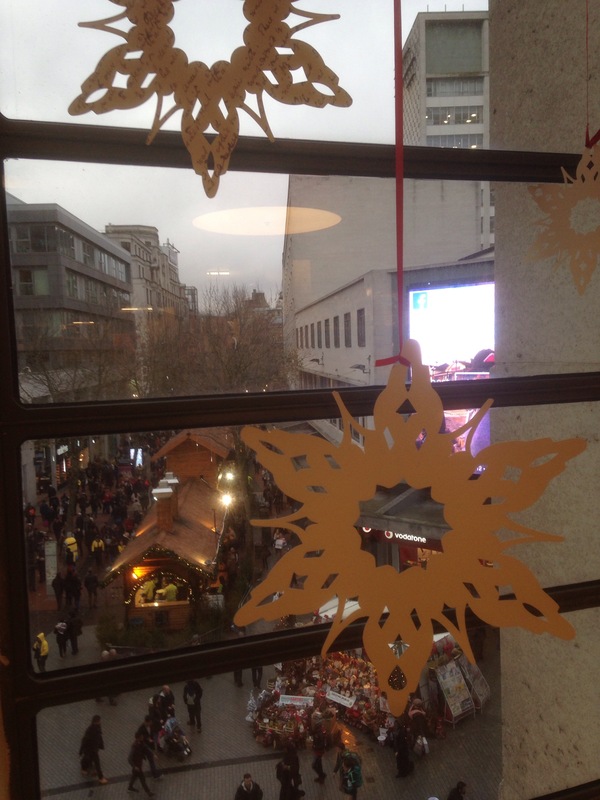 The view from the cafe of Birmingham’s German Market in the distance. 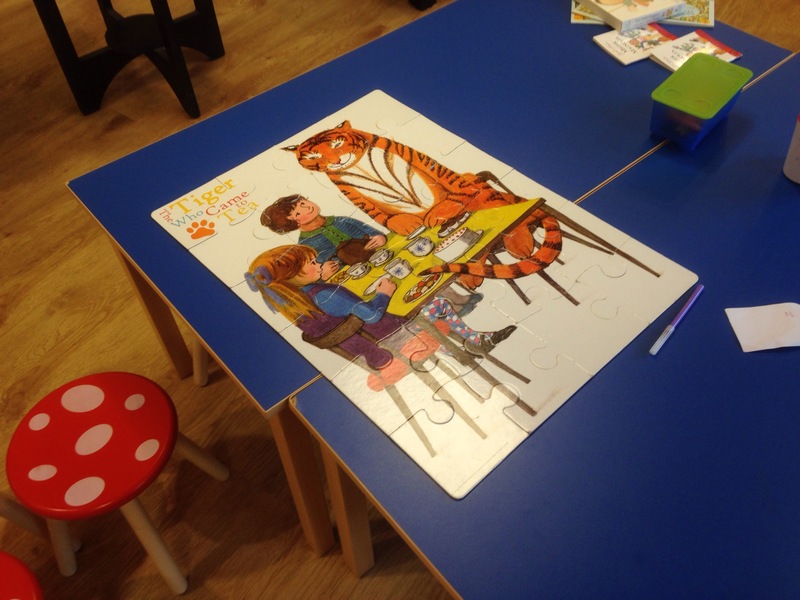 Children’s floor with plenty of activities. 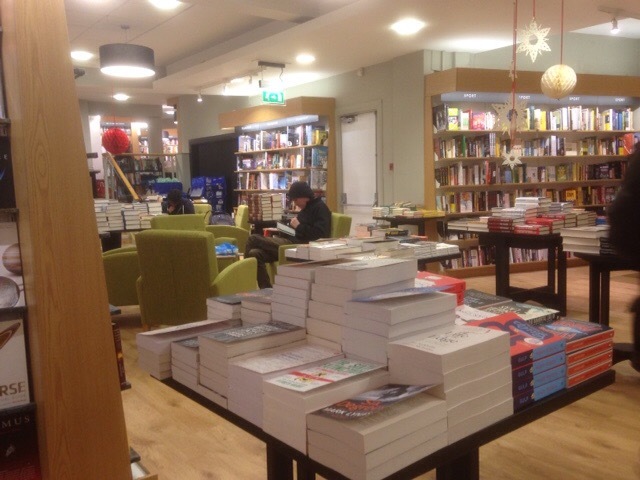 Books and coffee, whatever next? 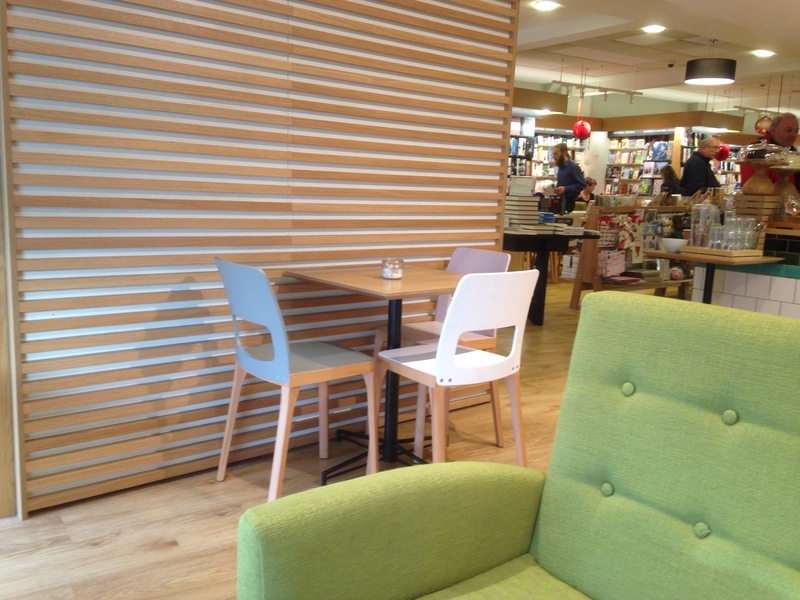 Cafe seating amongst the books. 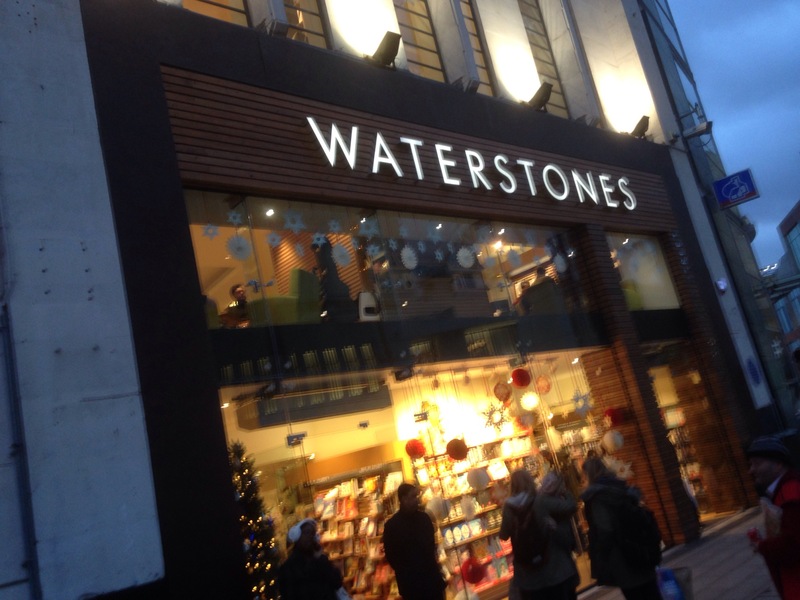 Waterstone’s Birmingham, High Street, 24-26 High Street, B4 7SL. Disclosure: I paid in full for my coffees and cakes. My opinions are honest as always. 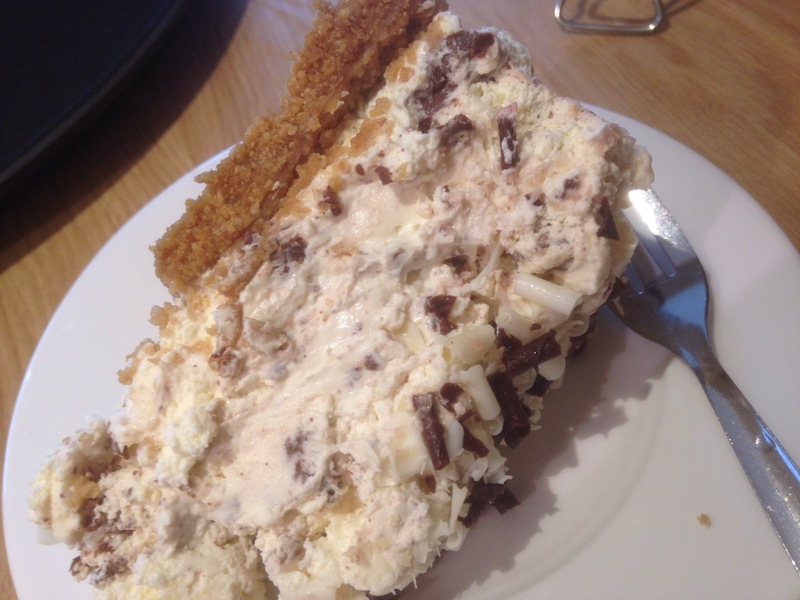 Mrs Mills Cakes makes celebration cakes, on the go granola bars, indulgent deserts and cheesecakes, biscuits for mail order and at food festivals, fairs and Brum Yum Yum Streetfood events. All cakes baked using free range eggs. 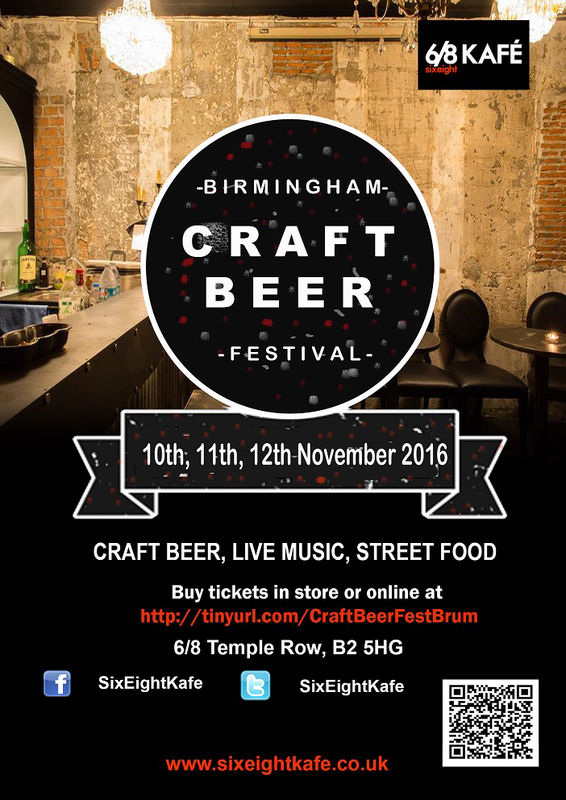 At Brum Yum Yum Kings Heath on the 12th Decenber. 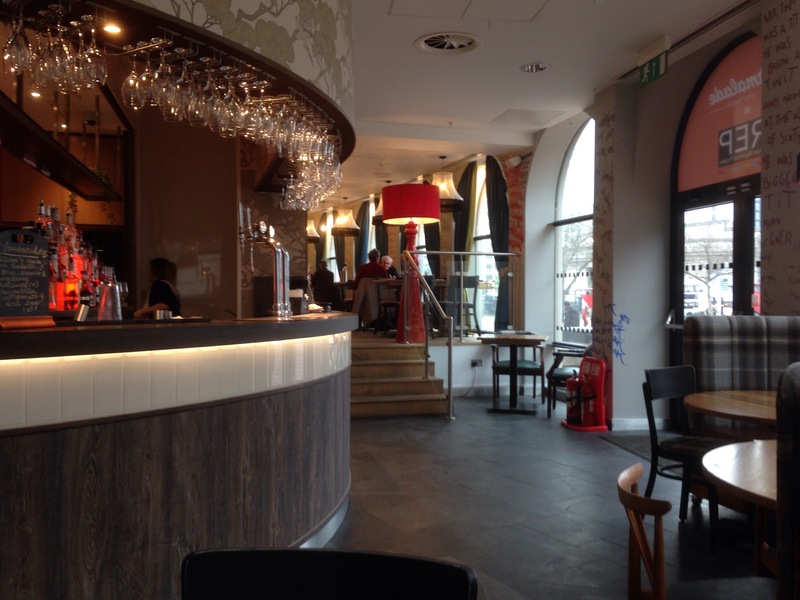 Veggie Foodie Lunch watch: Java Lounge, Colmore Row, Birmingham. Sometimes you just want a simple lunch. 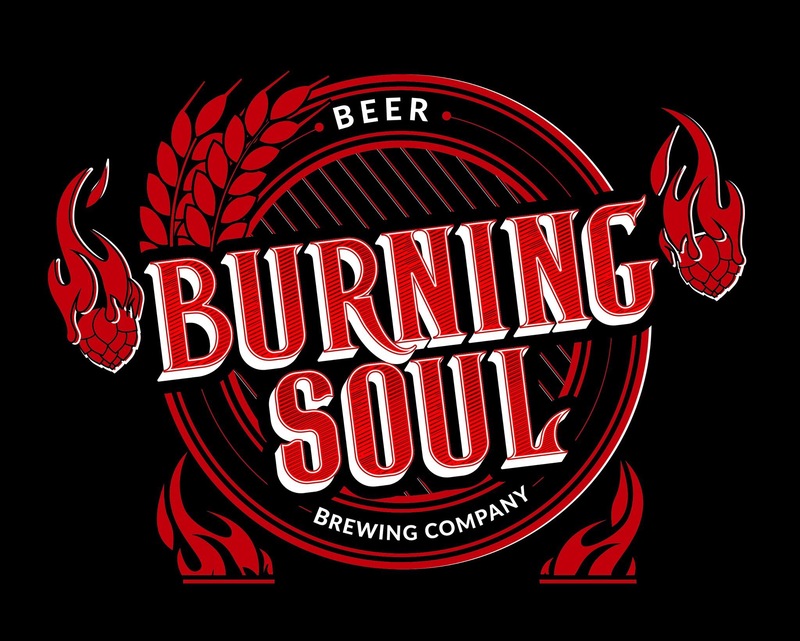 Nothing fancy, nothing glamorous, just something that hits the spot, is warming and non offensive. 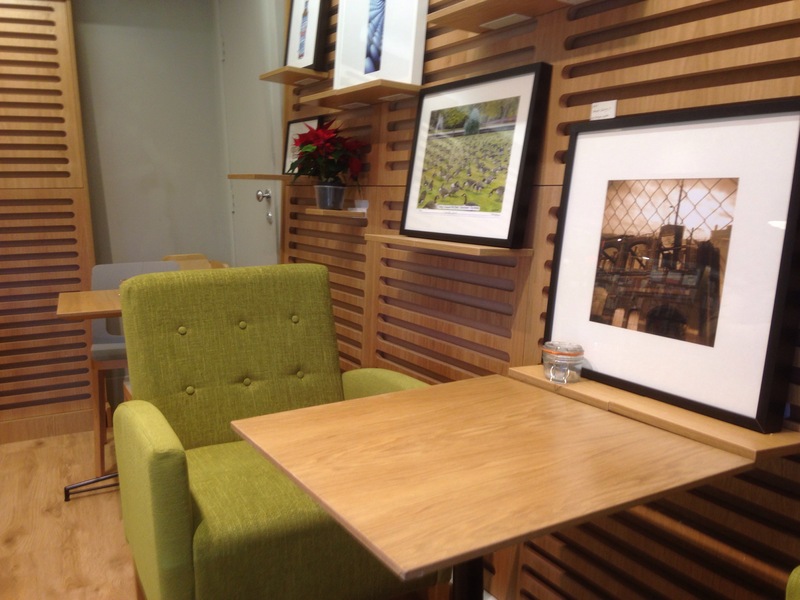 This is what I found at Indie Coffee shop Java Lounge on Colmore Row in Birmingham City Centre. Having stumbled in, as you do, though I can assure you I hadn’t had a drink or much worse. I thought let’s give the Toasted Falafel Wrap with tomato and onion a go. It came with 2 dips and a mixed side salad. I was impressed, the falafel wrap was a decent size, with the tomato and onion offering a contrast to the firm falafel inside. It had a good flavour and wasn’t in any way falling away in my hands or was tough to cut with a knife and fork. It was filling and even though I wasn’t sure of the dips which seemed an afterthought, maybe provide a oily chilli or balsamic dressing instead, it proved to be a decent lunch and not a rip off that some places are. 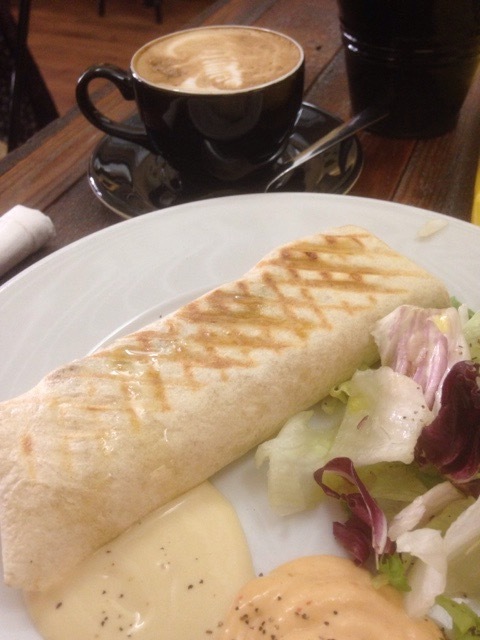 For just over a fiver I had a filling vegetarian wrap and a Flat White (what else!). 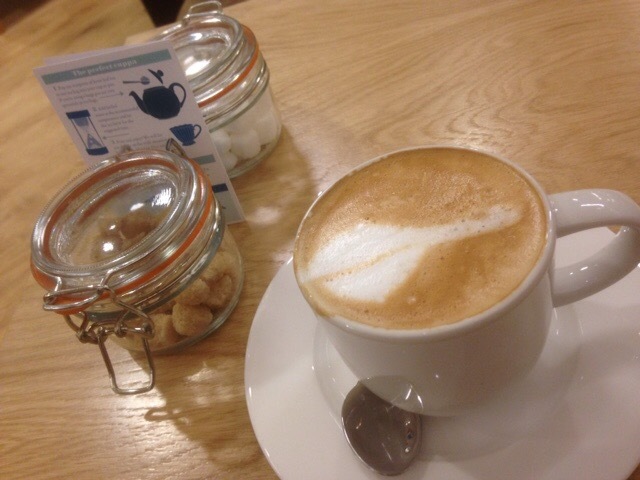 The flat white, pitch perfect, looked good. 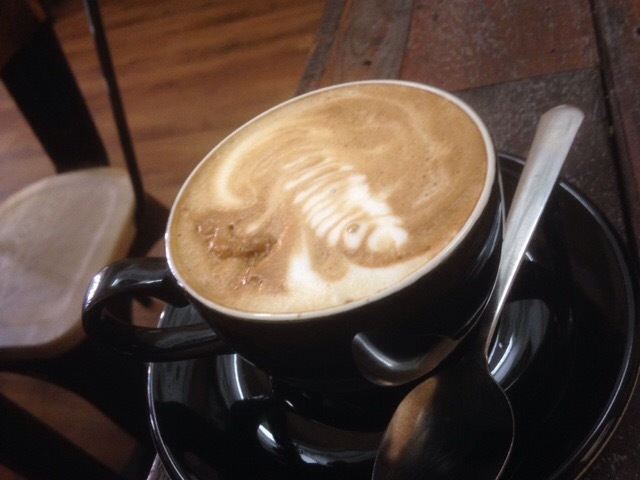 A really fine coffee. 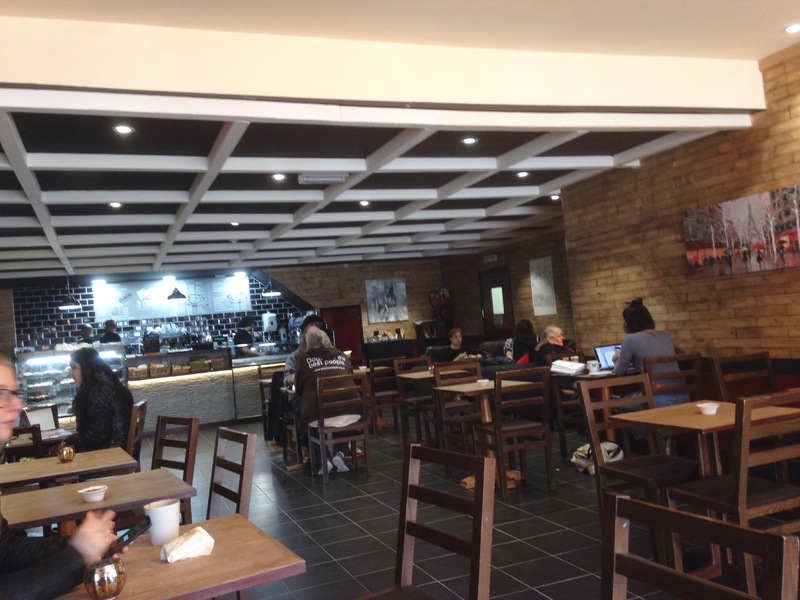 As the Java Lounge is only 5 minutes from the Birmingham Getman Market, it’s a lot more tempting for lunch for vegetarians than the overdose of meaty goods you can find there. It’s also inside and a darn site cheaper, unless you are having the cheesy garlic bread of course at the market. (Watch your breath though). You can find Java Lounge on Colmore Row 5 minutes from Victoria Square. I paid for my wrap and coffee myself and left with a bit more of a spring in my step than when I entered. 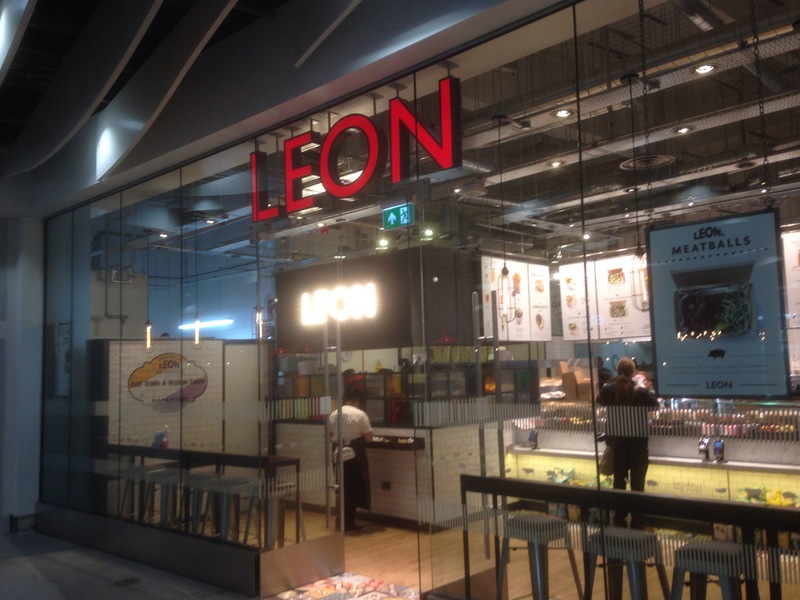 Review: Leon, Natural Fast Food in New Street Station, Birmingham. Now just imagine this..healthy fast food..now that’s a discovery..imagine all fast food was healthy. How many Marmite crisps would you eat? Now that’s probably just me, I think I’m the only sane person in the world that likes them, hey what do you mean, insane? 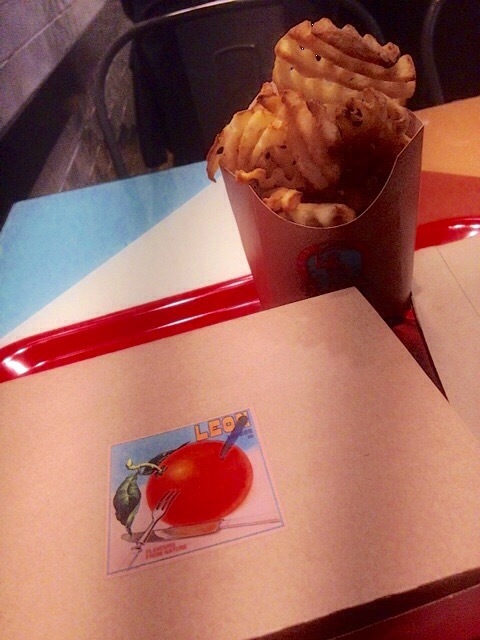 No seriously healthy fast food, that’s the domain of Leon, yes even their chips which are baked. 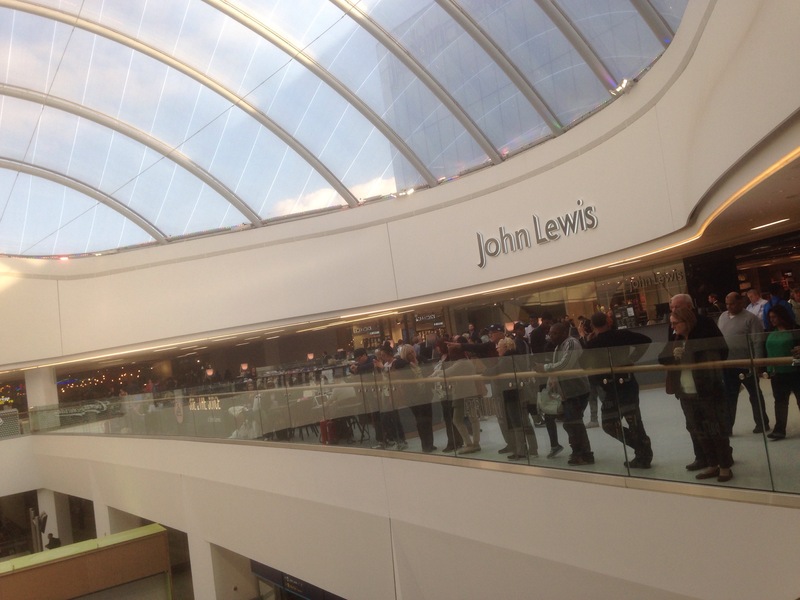 Leon has recently opened its first store in Birmingham temptingly close to the main atrium of the New Street Station / Grand Central complex. 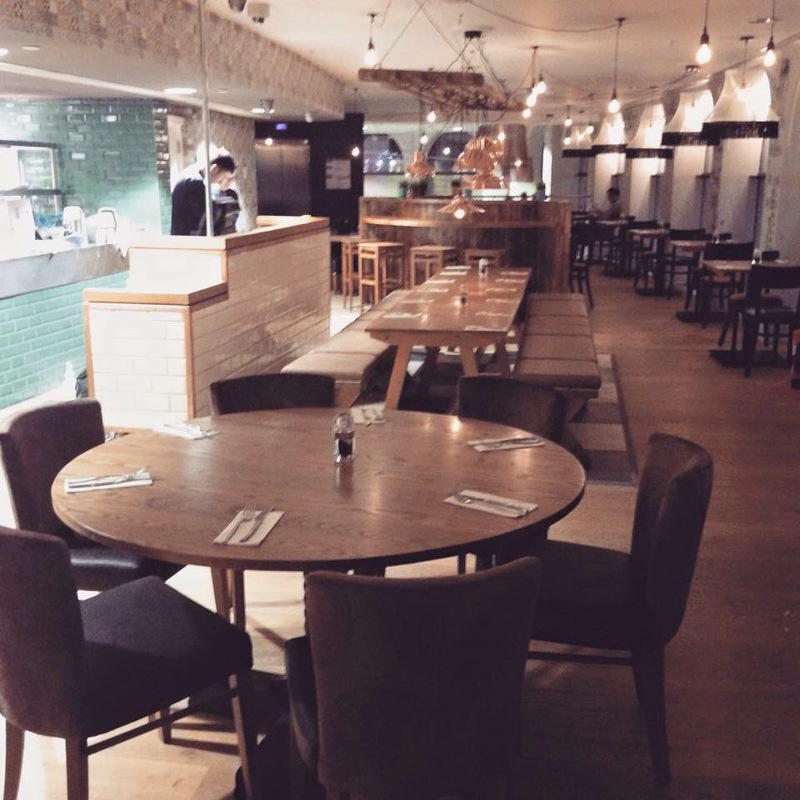 With branches famously in London for 11 years and an expansion plan in place, Leon will become more familiar outside of the capital in due course. Serving food from breakfast until evening. 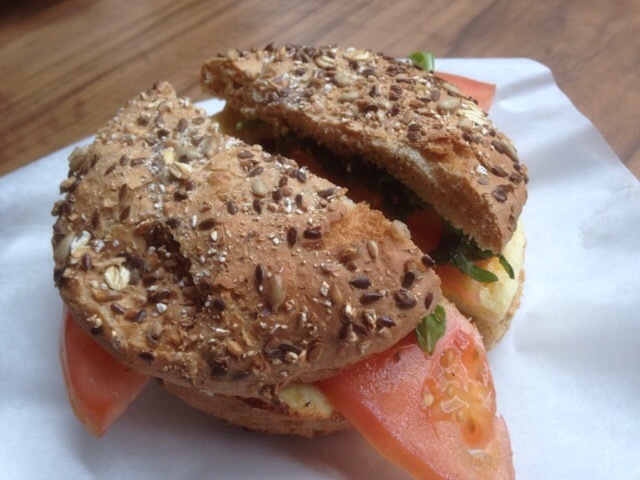 The menu includes burgers, wraps and superfood salads as well as breakfast baps, breakfast muffins, smoothies, and coffee. 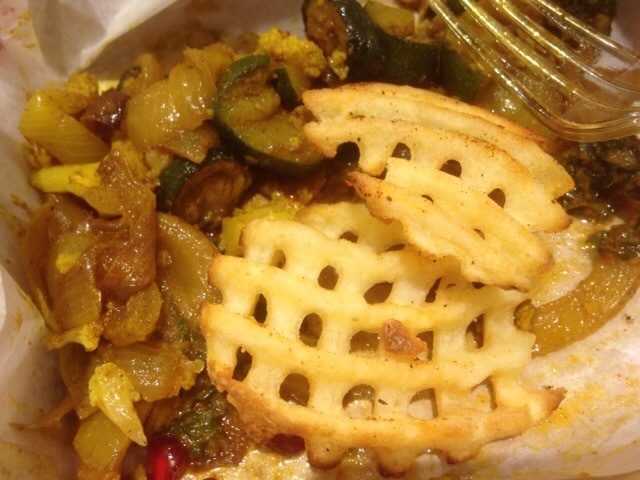 Fast Naturally Food with an excellent vegetarian and vegan choice. 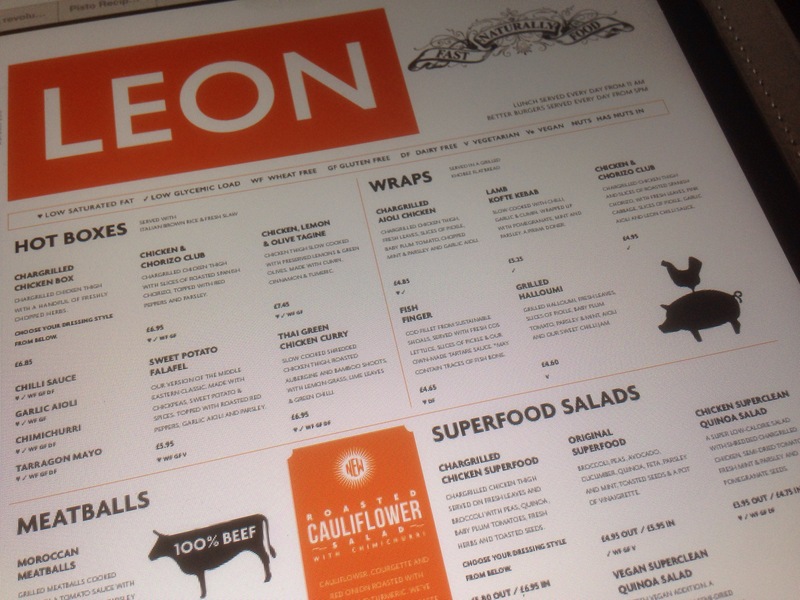 Wow, The Leon menu covers every moment. 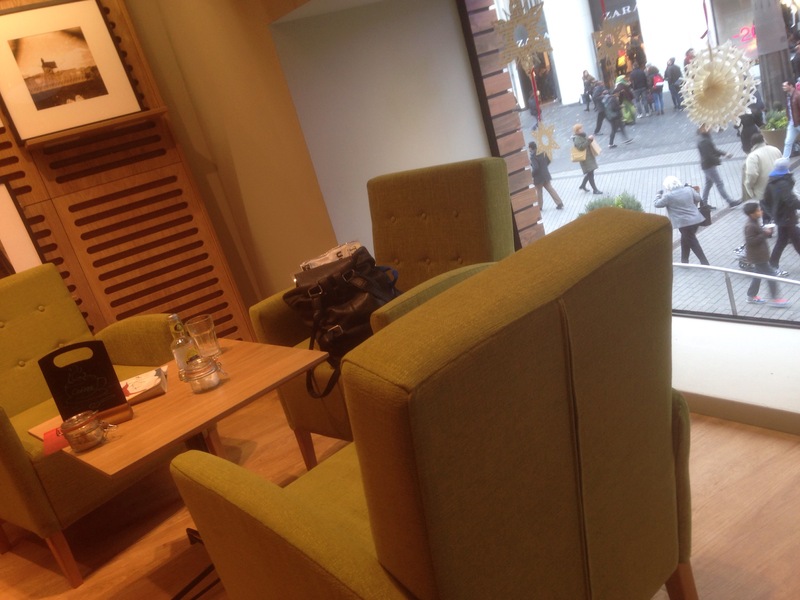 Though quite small inside the turnover of tables appears quite quick which is helpful. 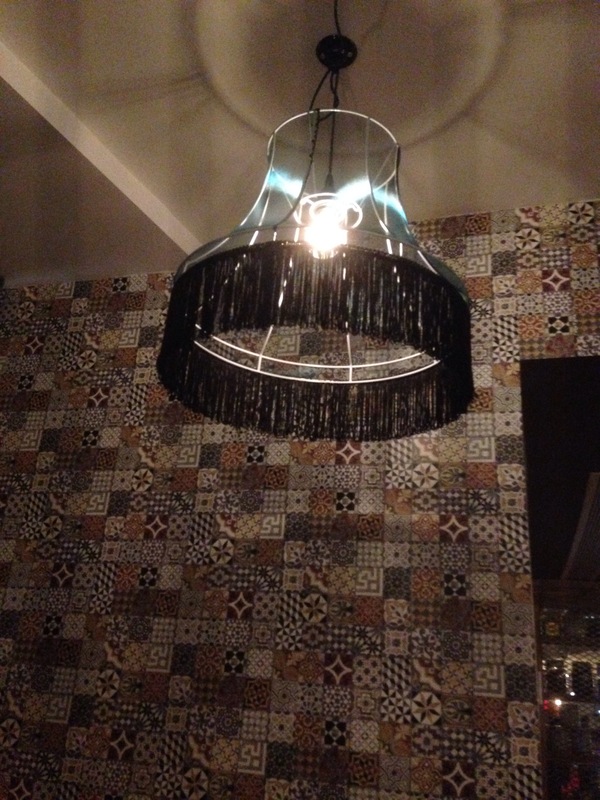 The decor is industrial feeling, but is light and feels bigger with tables not on top of each other. Plenty of space for cases, bags and buggies. It has a friendly feel and staff are happy to advise on dietary needs and ingredients in the dishes. 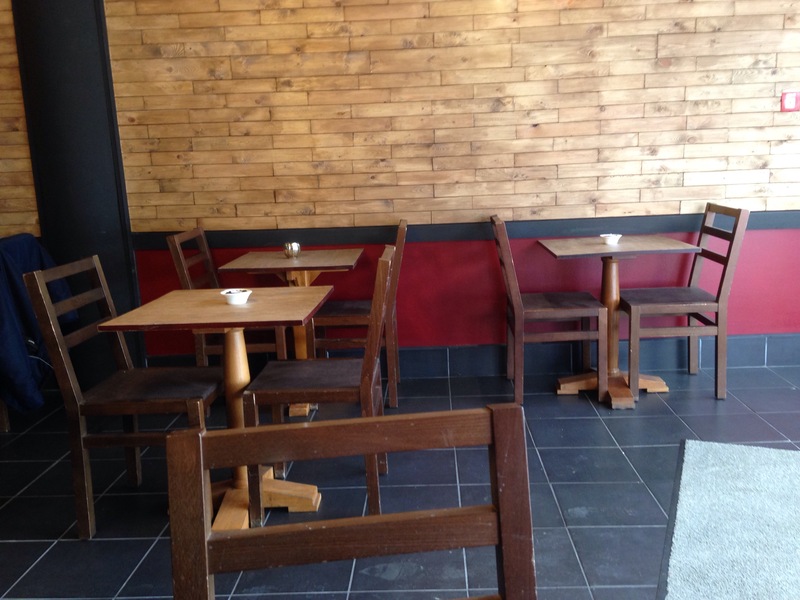 Service is also prompt and the restaurant tables are kept tidy and clean. 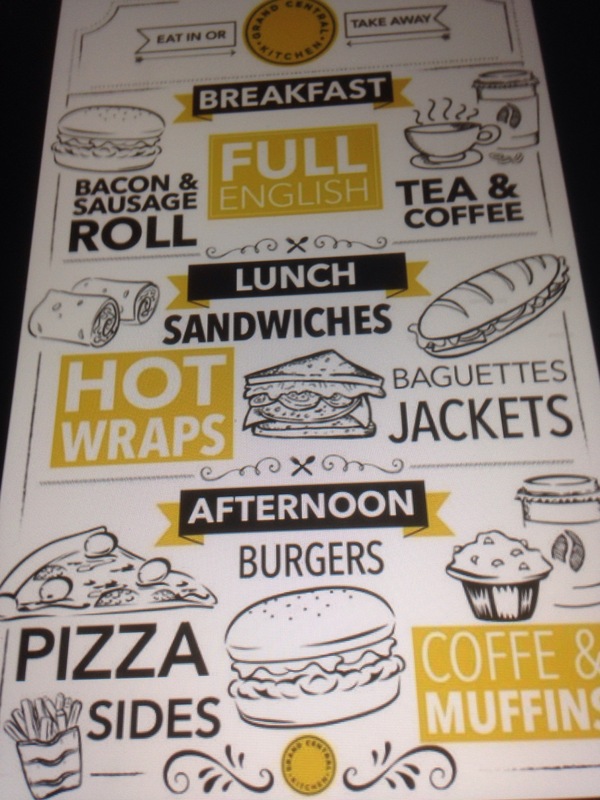 All food and drink on the menu is made fresh daily. Their coffee is fair trade and organic, as are their eggs, milk and porridge oats. 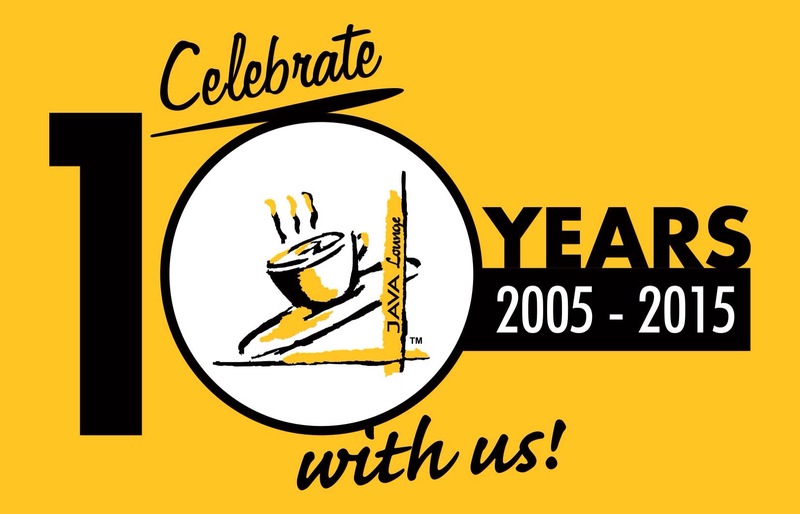 Leon are also a founding member of the Sustainable restaurant association. Leon was founded in 2004 and only employ people who are “full of sun”, (not full of chips). 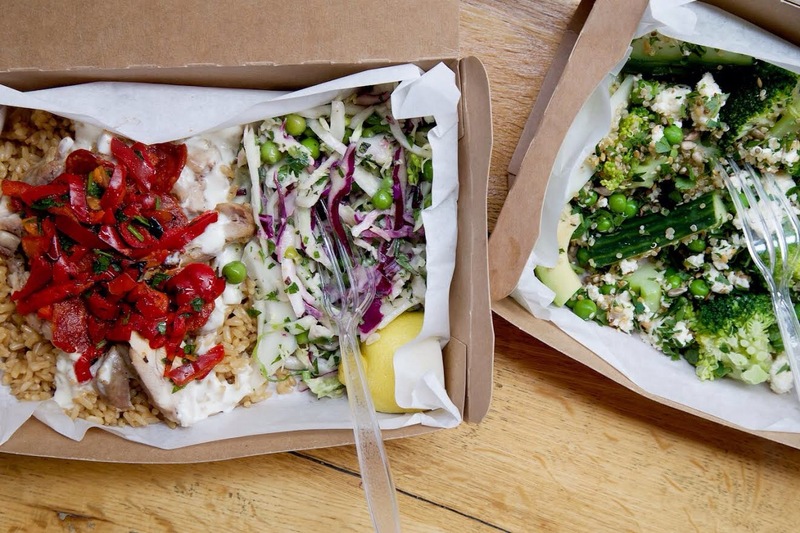 The award-winning, London-based company is as I’ve said the healthy side of fast food with a notable leaning towards Vegetarian and Vegan dishes. 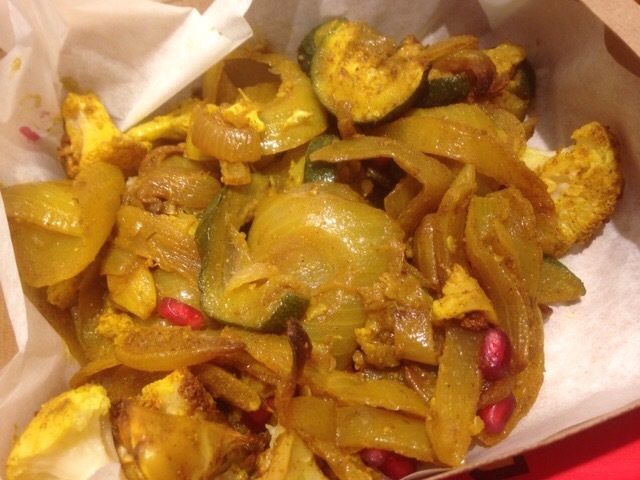 Take the Roasted Cauliflower Salad with Chinichurri: In my case onion, courgettes, pomegranate, roasted with turmeric and cumin with alioli and baked fries. (Side extra). £5.10 plus £2.50 for the fries. Packaged in a nice box, the inner cauliflower Salad packed plenty of flavour, cauliflower has always been a personal favourite and though I asked for a recommendation I knew I wanted to try this dish. The dish full of fresh flavours, crunchy textures with a good turmeric and cumin finish, was delicious. 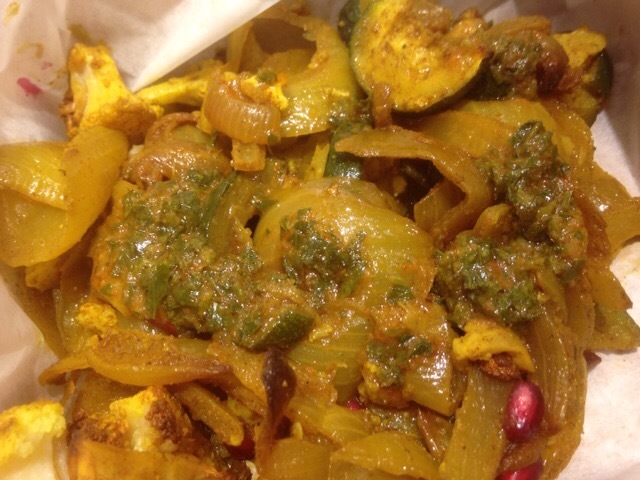 It felt healthy and nutritious, it felt warming and filling and good value for the price. The Baked fries on this occasion I hasten to add were not so good, though packing plenty of potato flavour they were not to hot and felt disappointing in the end. I like the sprinkled seasoning and the curly look though and would order them again, as i’m sure they could be done better. Nice alioli though. With my food I ordered a Flat White. Though their were delicious juices and smoothies and coconut water on the menu an opportunity to try a coffee never escapes me, and it was a very good flat white, great for a take away. Leon is a chain, and though I’m not usually a massive fan of chains I’m a big fan of what I’ve seen and experienced thus far. It’s because they do care about Vegetarians and Vegans, about the food we eat and about the ethics of it all. 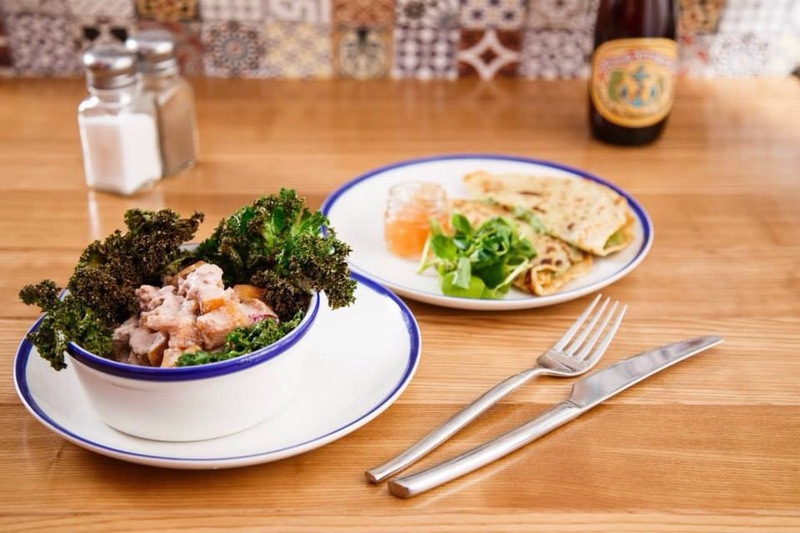 Yes, Birmingham has another chain, and yes I wish somebody independent could offer this kind of food, this kind of experience, but until that happens Leon will be a place I’ll call back to any time of day. It’s ethos should be applauded and the food on offer with its high nutritious leaning eaten. 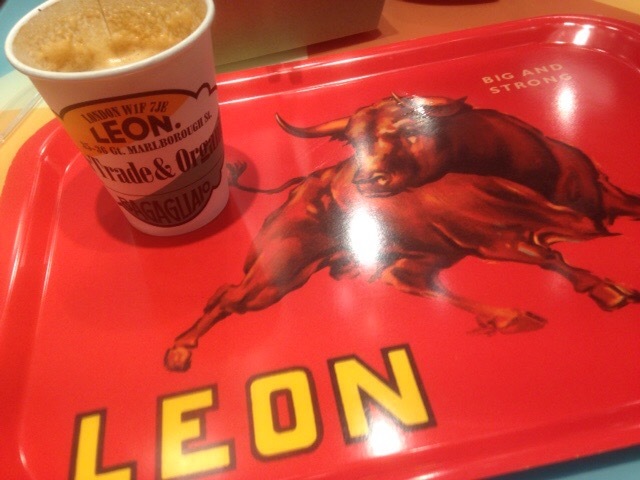 Food should taste good, and if it can do you good as well even better and for this Leon is a vegetarian friend. 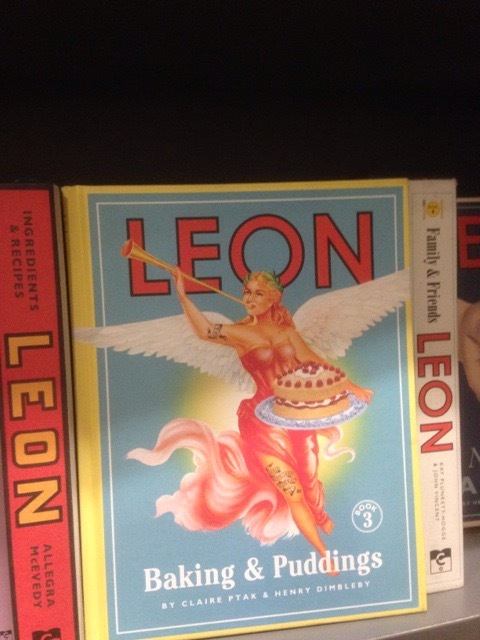 Leon cookbooks available at all good booksellers. 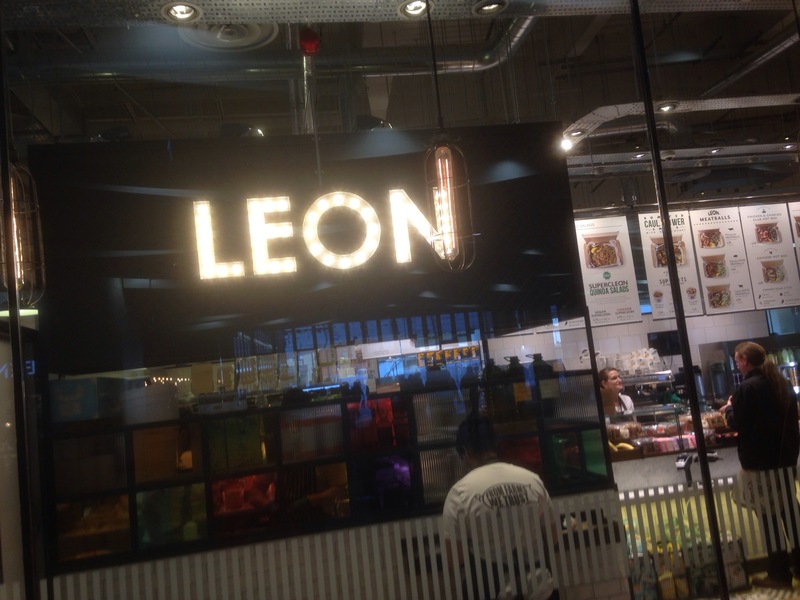 You can find Leon in Birmingham at Unit 25, New Street Station B2 4QA. 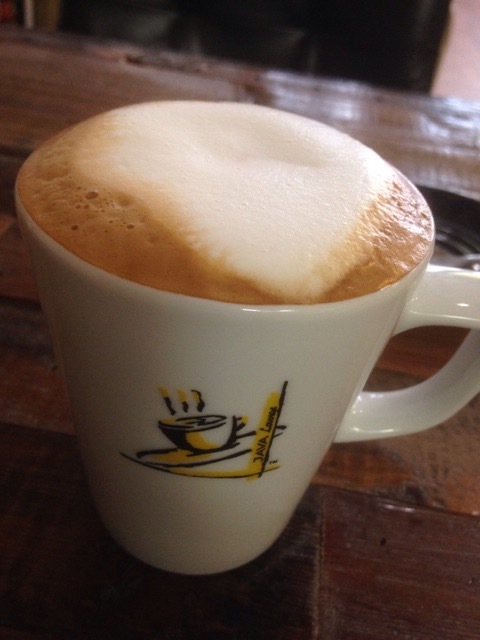 Open from 6.30am-10pm every day apart from Sunday which is 8am-10pm. I paid for my meal in full at Leon. My views are my own, honest as always. 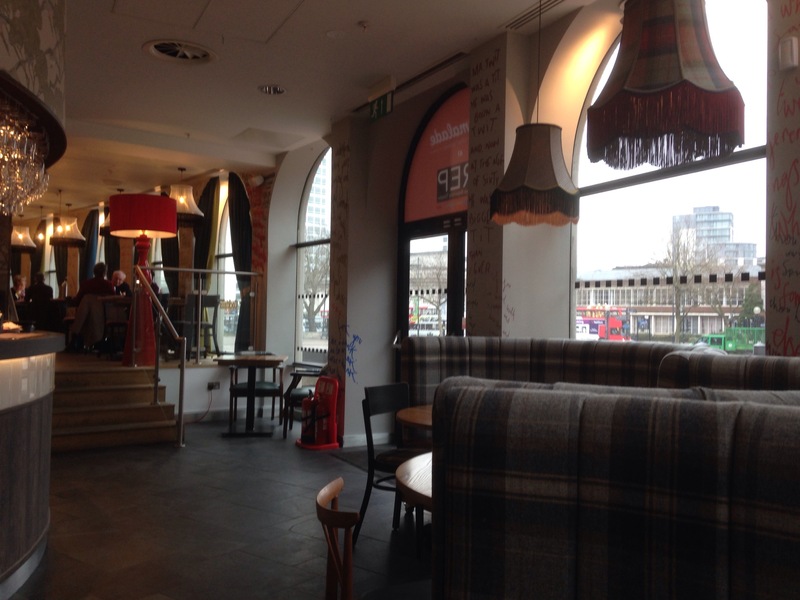 #Coffeetime: Java Lounge, Birmingham City Centre. 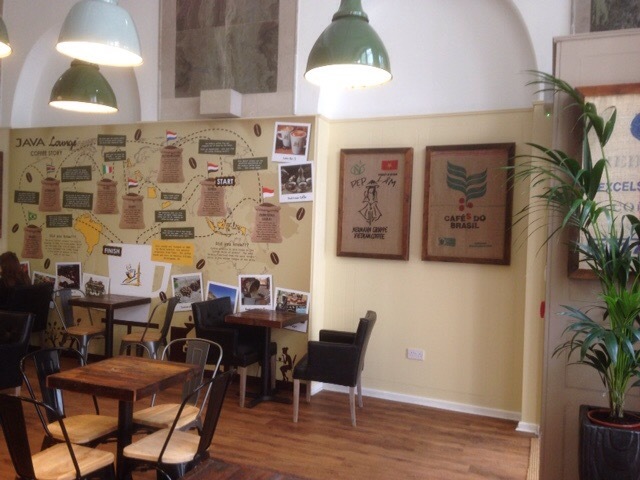 The Java Lounge has been brewing its coffee in Moseley for ten years now and to celebrate the unique independent coffee shop milestone has opened up a second store in the beautiful Grade 1 listed building on Colmore Row. 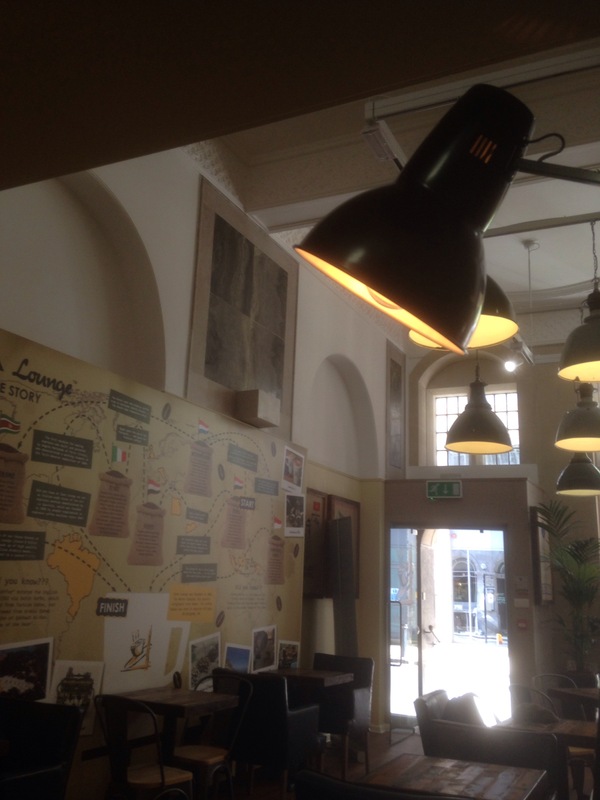 Owned by Birmingham born Akram Almulad, Java Lounge offers Birmingham a taste of where coffee began, in Yemen. Which is where his parents were born. A few years to go this used to be the building that was home to Hudson’s Coffee Shop. 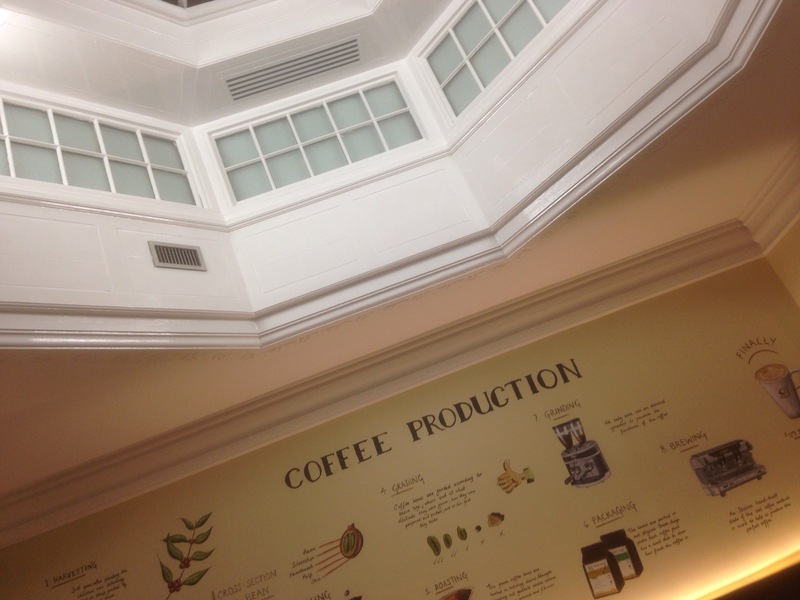 At its time probably the best place to drink coffee in Birmingham City Centre. It’s building, coffee and refined table service a beacon of quality amongst the advancing chains, which were taking over the city. 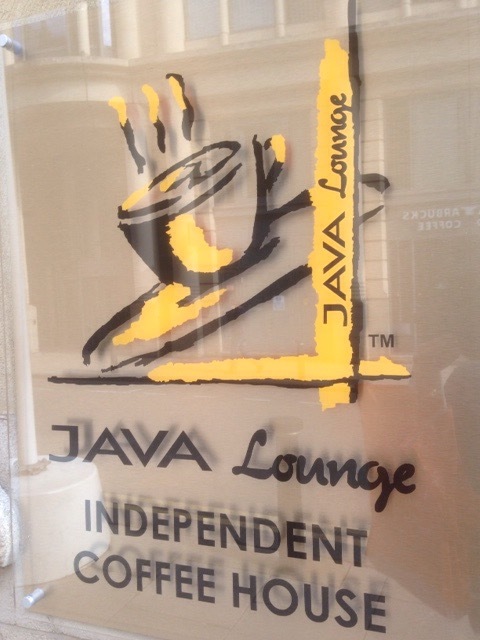 Happily, independent Java Lounge have now restored this coffee Mecca to its vintage beautiful best. 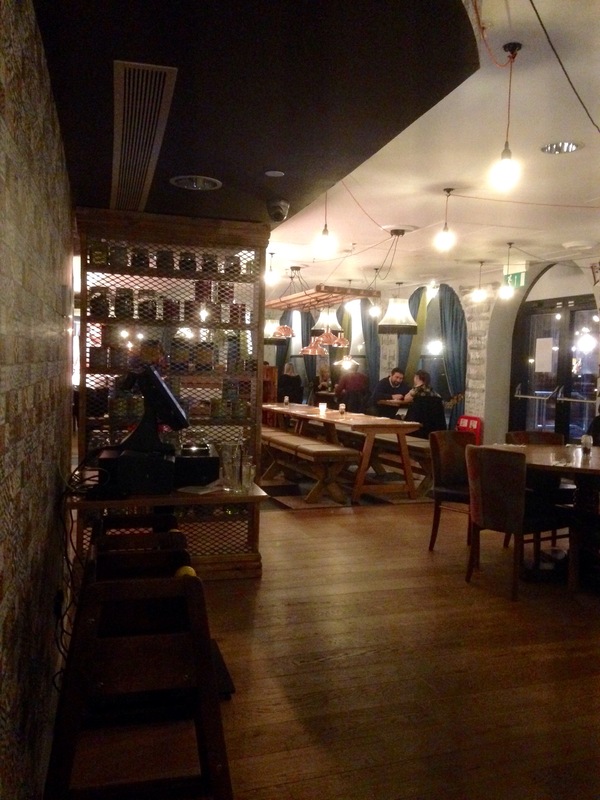 Both rooms have their charms, solid wooden tables, plenty of space. An urban feel. 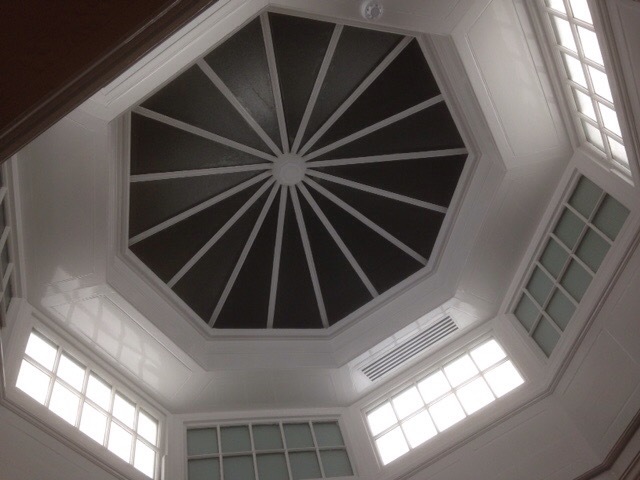 They’ve made good use of the old inside of the grade 1 building and maintained the gorgeous glass ceiling in the second room. It’s a fine space, one worthy of good coffee and food. 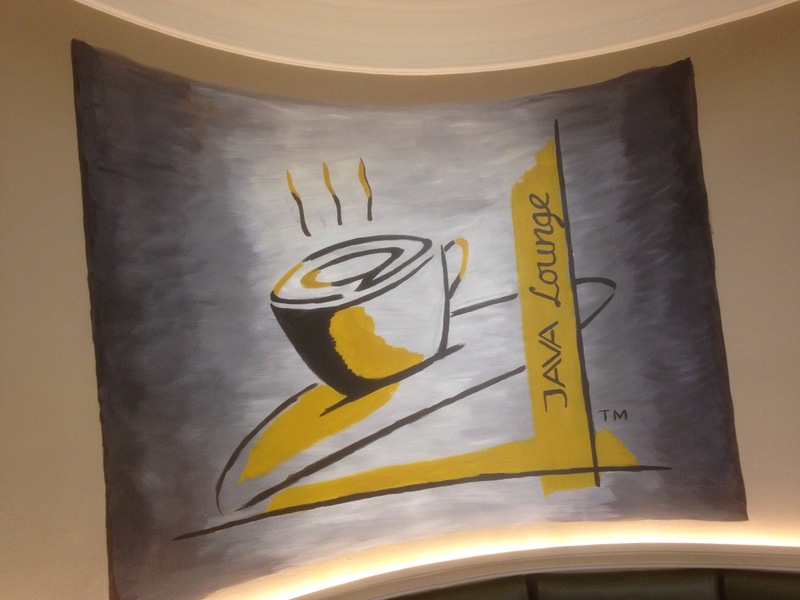 Coffee at Java Lounge is the convergence of science and art. They take advantage of technological advancements in standardisation and innovation whilst preserving the passion and craftsmanship of the cultural traditions. You can buy lots of coffee. 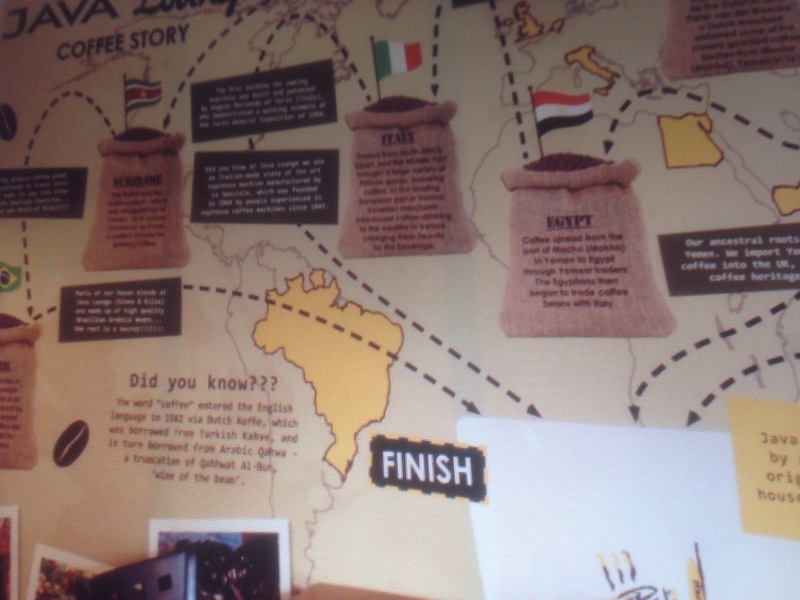 From Latte to Macchiato to Mocha, plus single origin coffee from around the world (from Yemen to El Salvador, only available as yet in Moseley. Plus from this week the delicious sounding double mocha). 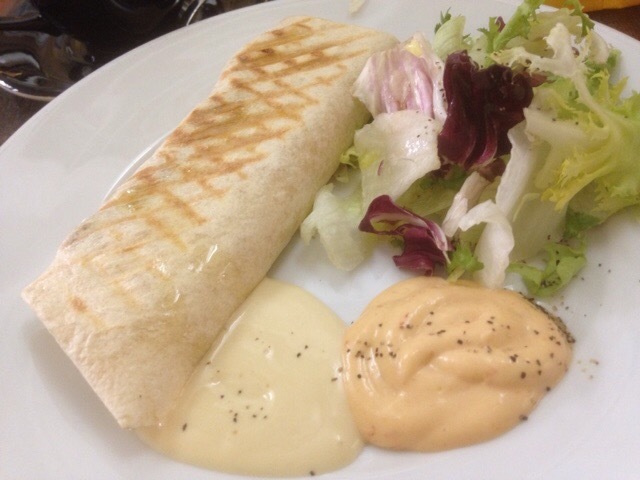 There are numerous inviting cakes, hot food, such as wraps, (with a good choice for vegetarians) and salads. Plus a range of teas and milkshakes. 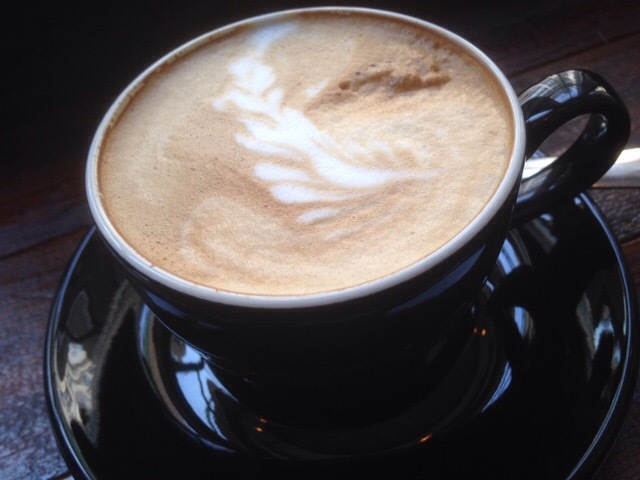 Flat White at Java Lounge. The Flat White had a velvety consistency, with a good strong espresso hit which had the right amount of microfoam and flavour. One of the best no doubt in Birmingham. I’ve visited a few times over the last few weeks, on the three times I’ve had a flat white it’s been consistently excellent. 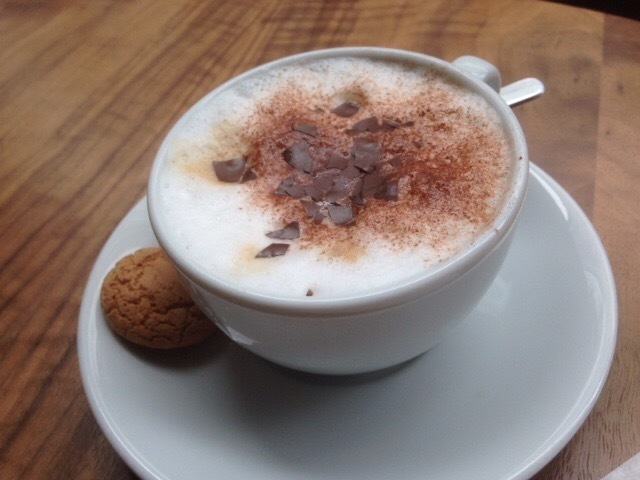 My Cappucino I’ve tried was also very good, the right side of frothy, creamy and with a good espresso flavour. 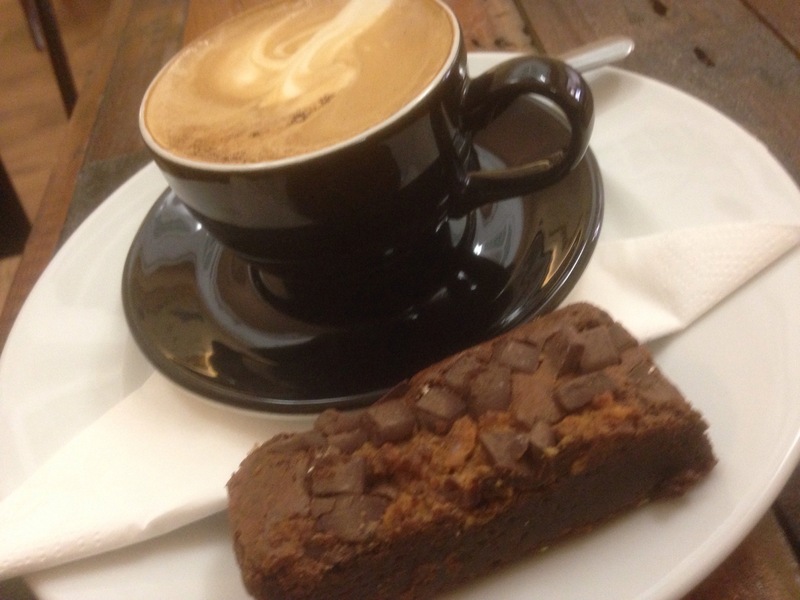 The chocolate brownie, was delicious, a harmonious dose of chocolate and light feathery textures. 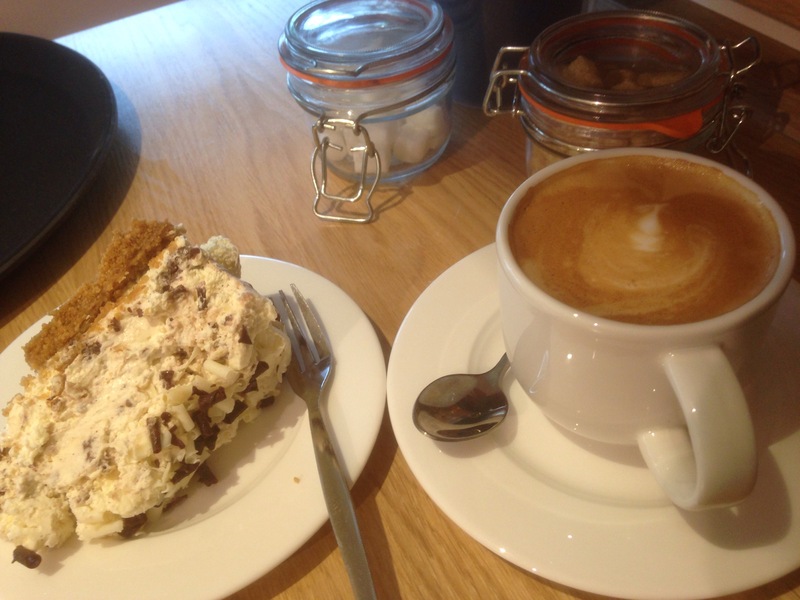 Beautifully combined and with a hit of chocolate that combine yes the silky flat white well. 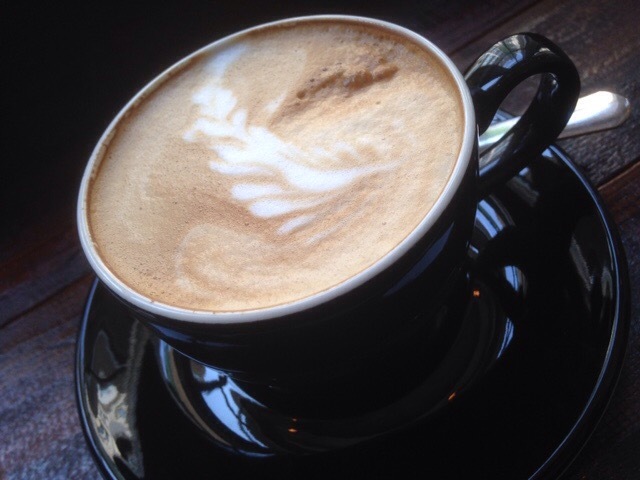 Java lounge is certainly one of Birmingham’s best coffee houses. 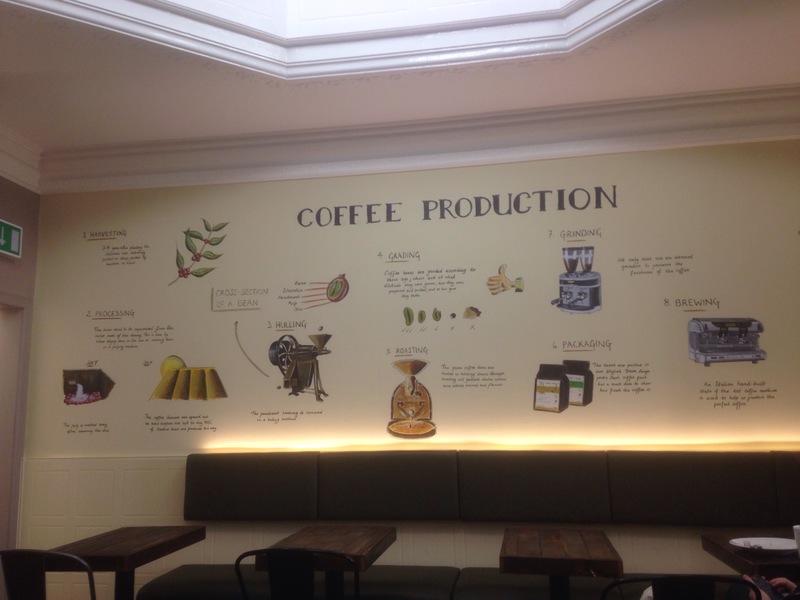 The passion for the coffee comes through in the vibe of the space, the service and in the coffee itself. It’s has a good all round experience with a City charm and this makes a worthy stop off for locals and visitors. Disclaimer: all coffee and food was paid for by myself and as per usual it’s an honest review of my experiences. 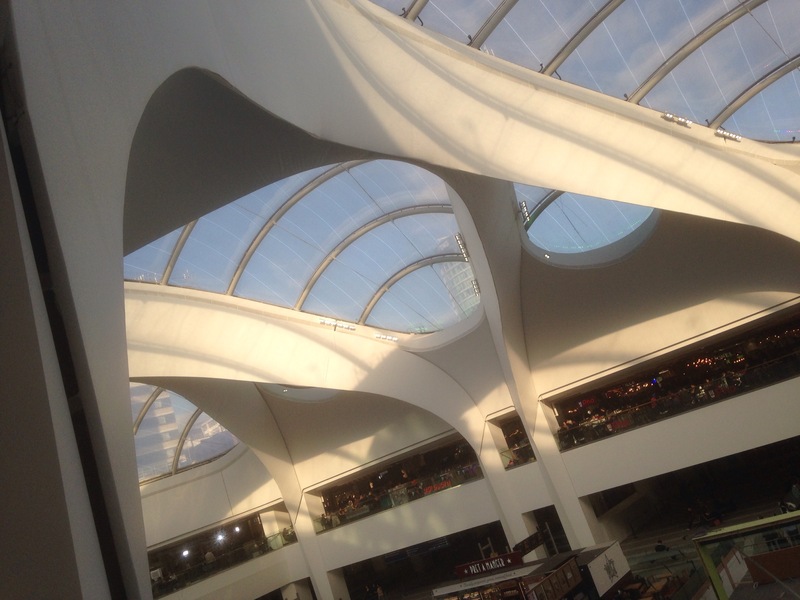 Leon is bound for Grand Central Birmingham. Now food should taste good, and do you good. 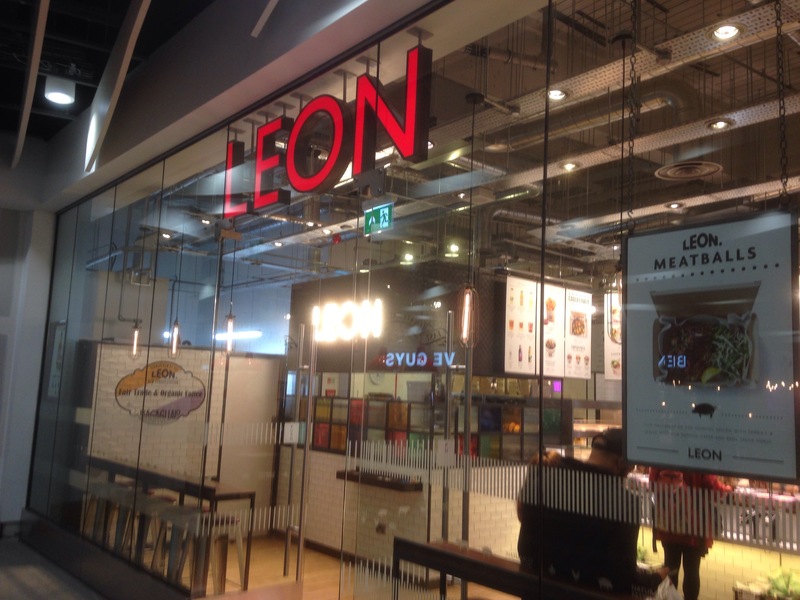 Well that’s the ethos of Leon the “naturally fast food” restaurant that has been a major success since its Carnaby Street opening, in 2004, will open up a new restaurant in Birmingham New Street Station. 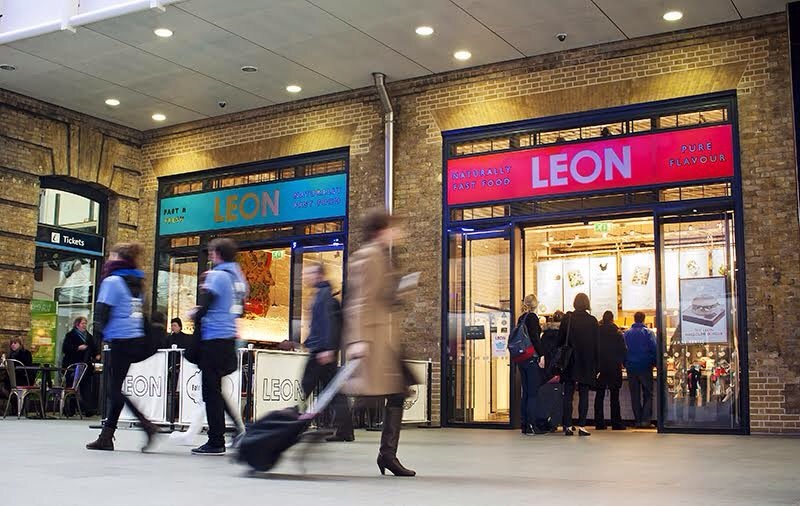 Leon has further London branches including Ludgate Circus, Spitalfields, The Strand, Regent Street, Cannon Street and Bankside. Owner John Vincent sees the Birmingham restaurant as a flagship site. He founded the restaurant with chef Allegra McEvedy and Henry Dimbleby, the once Governments advisor on school meals. It is named after Mr Vincent’s father. The restaurant are most famous for their takeaway boxed meals. 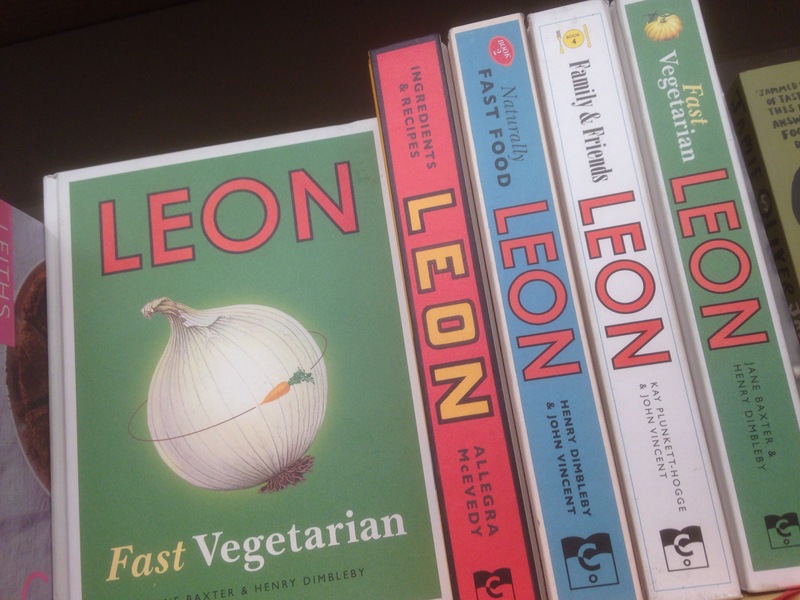 For Vegetarians and Vegans Leon has often been cited by those in the know, as been one of our best foodie friends with numerous options on their menu. Wrap: Grilled Halloumi with fresh leaves, pink cabbage, slices of pickle, tomato, parsley and mint and sweet chilli jam. Salad: Original superfood- Broccoli, peas, avocado, cucumber, quinoa, feta, parsley and mint, toasted seeds and pot of vinaigrette. Roasted Cauliflower and Courgette salad, and roasted Aubegine pot side. Plus Better Burgers after 5. Veggie is Grilled Halloumi burger. The award winning food menu looks very tempting and from what I’ve read, the dishes are popular and well liked, so all I have to say is bring it on. 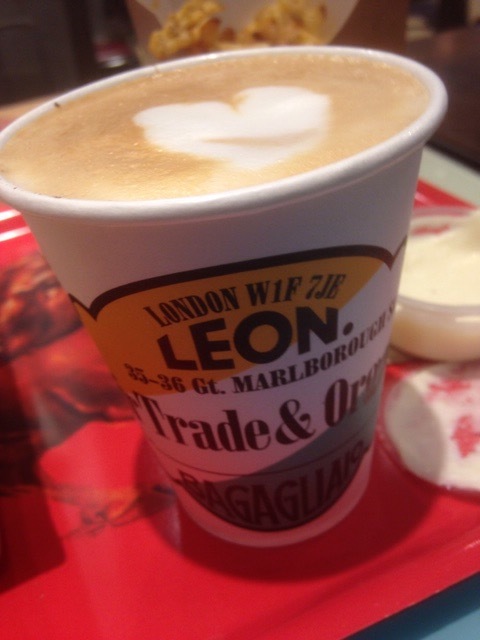 Leon also serves teas and organic, fair trade coffee daily. 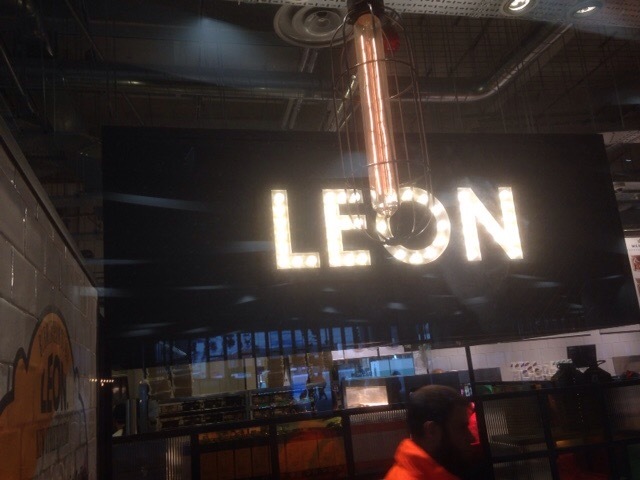 Leon will be opening at New Street Station in a few weeks time. Disclaimer: Photo and images courtesy of Leon. Apart from the first two that are mine, as are the Grand Central photos. 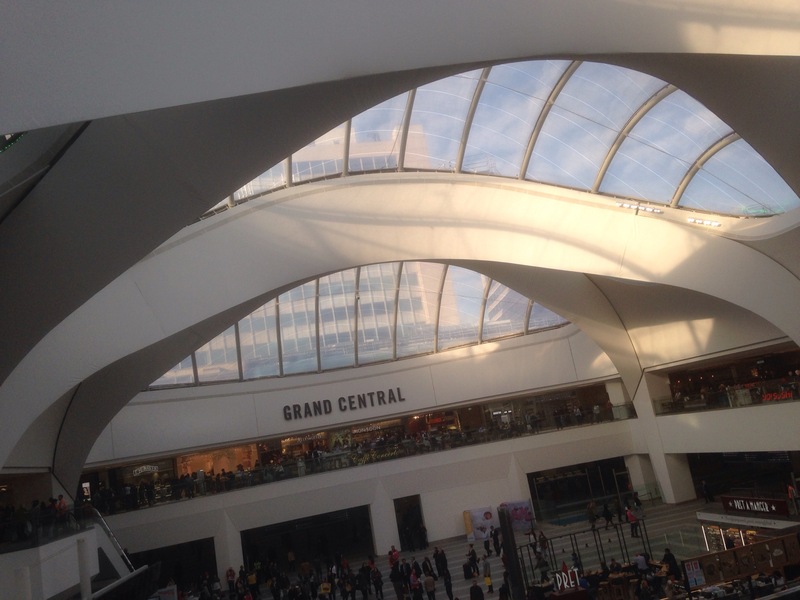 Grand Central Birmingham/New Street Station. 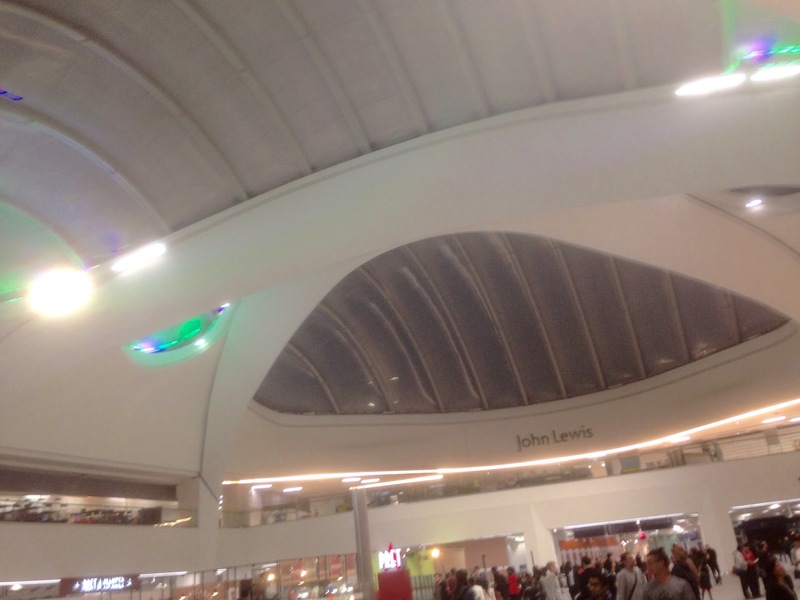 Home of Leon in Birmingham. 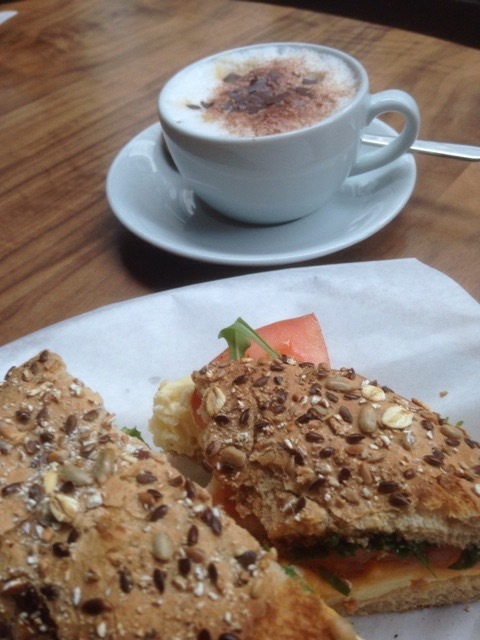 Review: A #coffeetime and #Veggiebreakfast mash up at Grand Central Kitchen Birmingham City Centre. 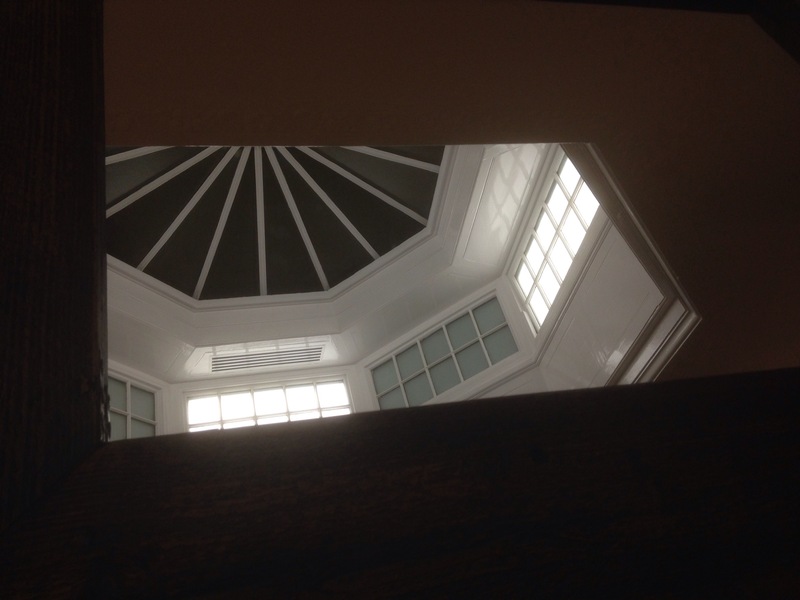 The grand in the name of this new coffee/cafe on Stephenson Street is from the view inside, looking out. 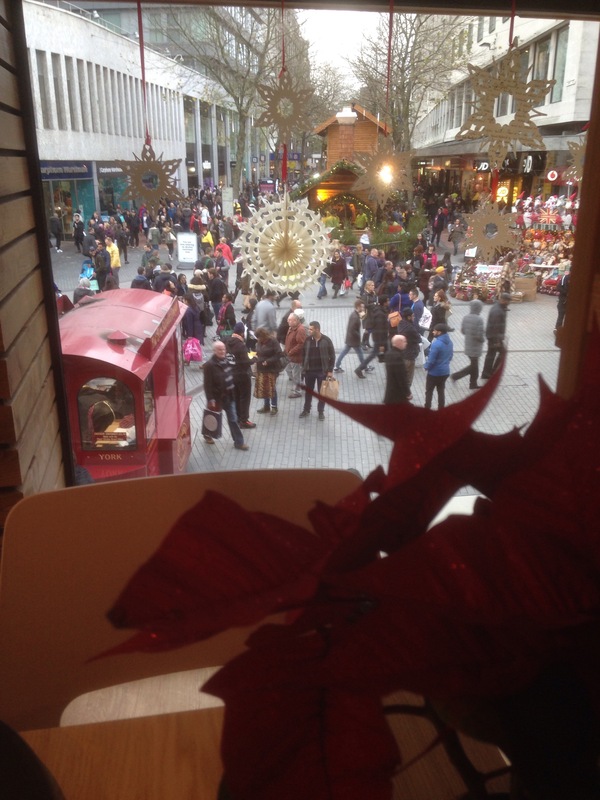 Sitting in the window one early Saturday morning whilst waiting for our train to take us to Suffolk from New Street Station opposite, one could feel that this was another era. Another brief encounter. 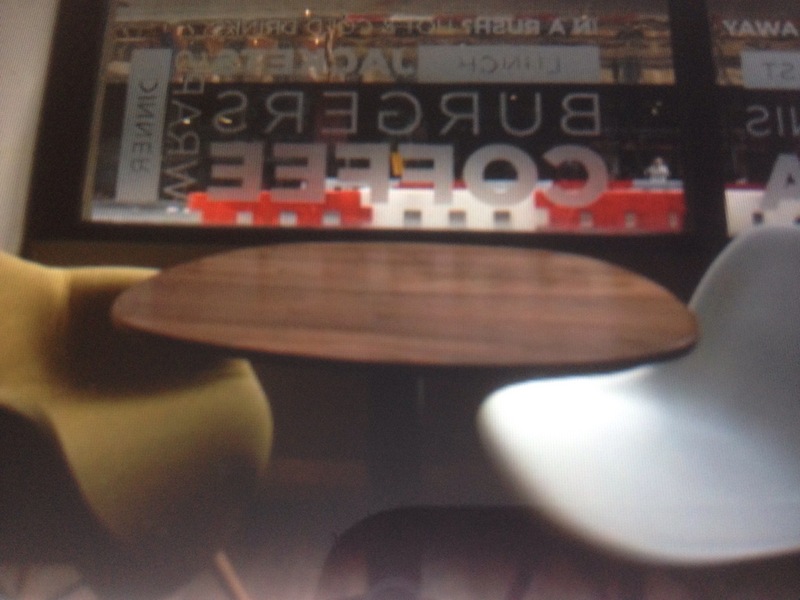 The view is the reflection of the Macdonald Burlington Hotel in the new Grand Central station window, it’s lovely even in the grey early cool, not the misery at all of the roadworks on the street, but the promise of a new dawn, a new era, a new independent coffee shop with extras, yes breakfast, yes pizza, yes burgers, yes beer, yes good Vegetarian options. 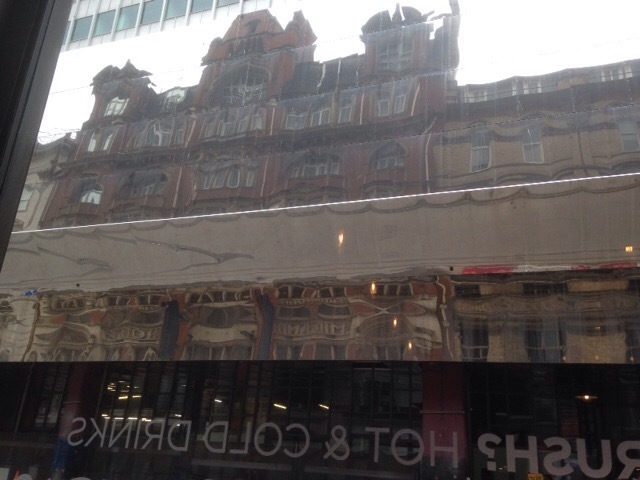 The angled mirror cladding on the outside of the almost here Grand Central Station is the culprit for the reflection. Grand Central Kitchen reminds me of one of those places you may go to in London for breakfasts, a stop over a refuelling in the early morning shut eye. I like it. 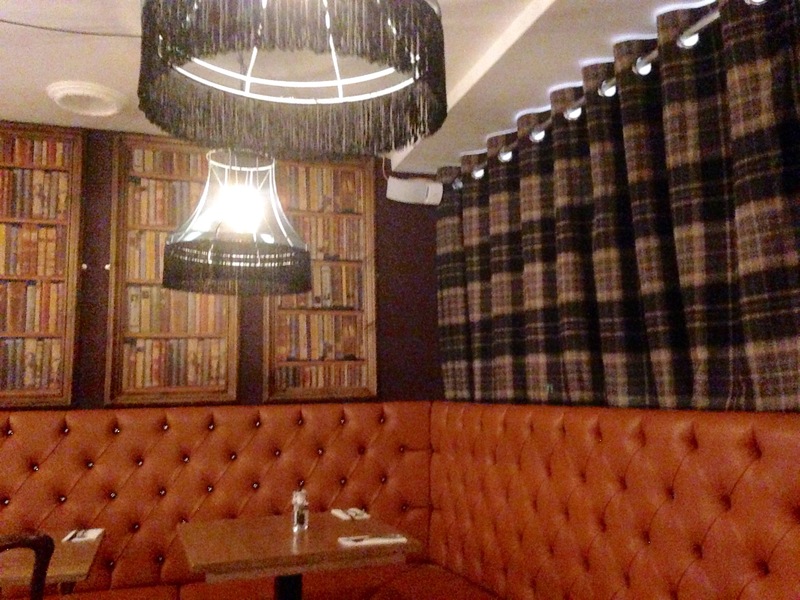 It’s dark outside lends itself to a brighter interior, colourful, laid out well with clear menu boards behind a buffet bar and functional comfortable furniture. As it was breakfast time, that is what Ruth and I ordered. The Vegetarian options are very good. On the advice of the friendly waiter I went for my own concoction from the breakfast hot buffet. 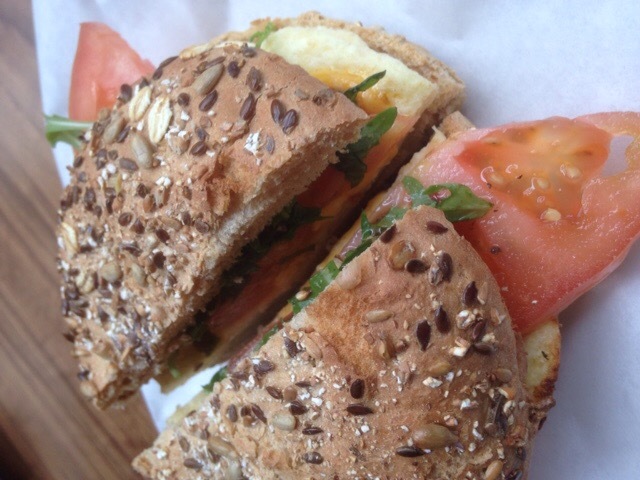 A breakfast of tomato, rocket, and cheese omelette, in a brown seeded bap, it was delicious, the bap fresh, not claggy or stale, the cheesy omelette perfectly cheesy, well made and with my own hand chosen additions of tomato and rocket a satisfying and ‘grand’ breakfast. Served with a good cappuccino and a top notch flat white. The Flat White alone is worth stopping for. 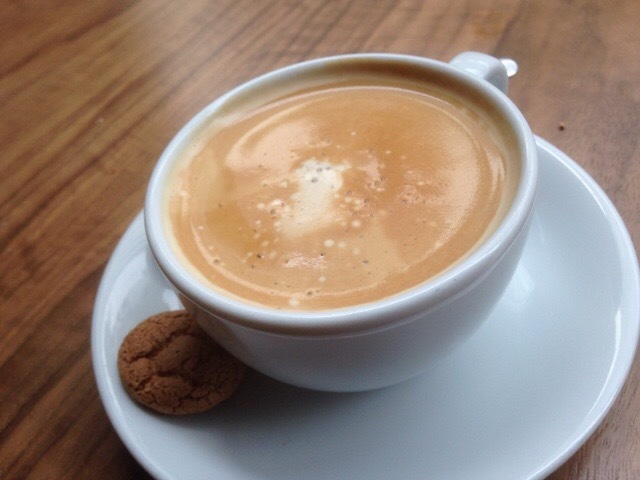 A good taste of coffee, great for the morning. 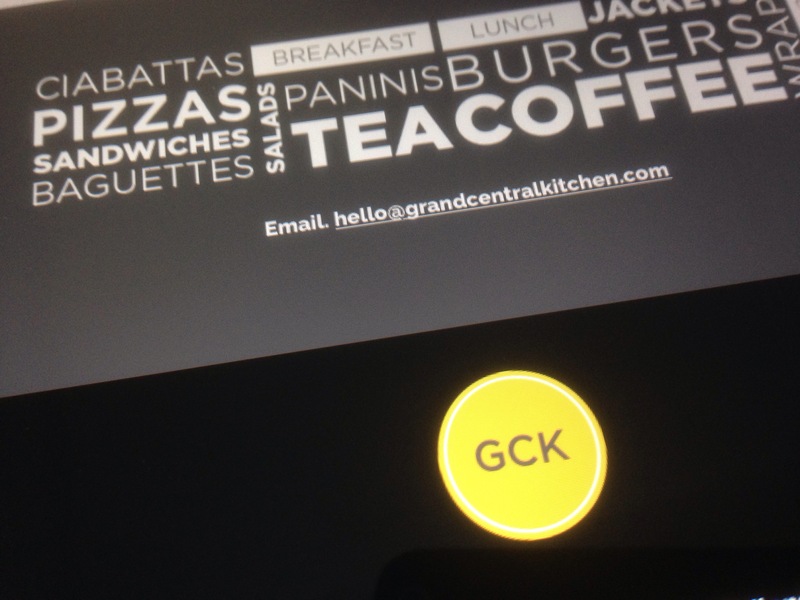 Grand Central Kitchen Also serve veggie pizzas, veggie burgers and Pannino, ciabatta, and sandwiches, with various veggie fillings. Plus, 2 veggie wraps, falafel and Humous and vegetable melt. 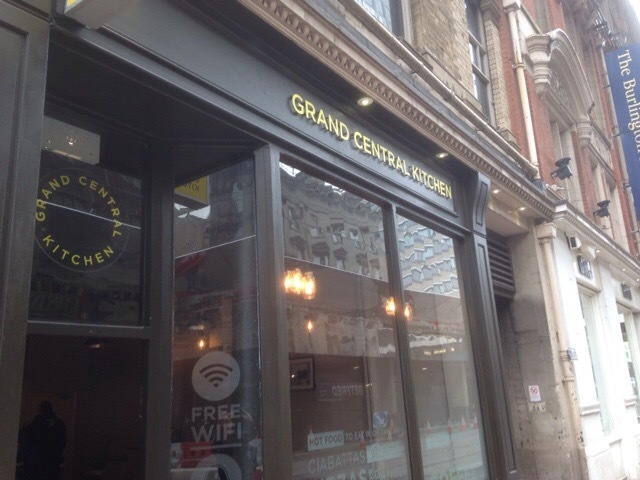 Grand Central Kitchen do takeaways too, which I’m sure will be very popular in months and weeks to come, with the station opposite. In fact a few people came into take away whilst we were there. 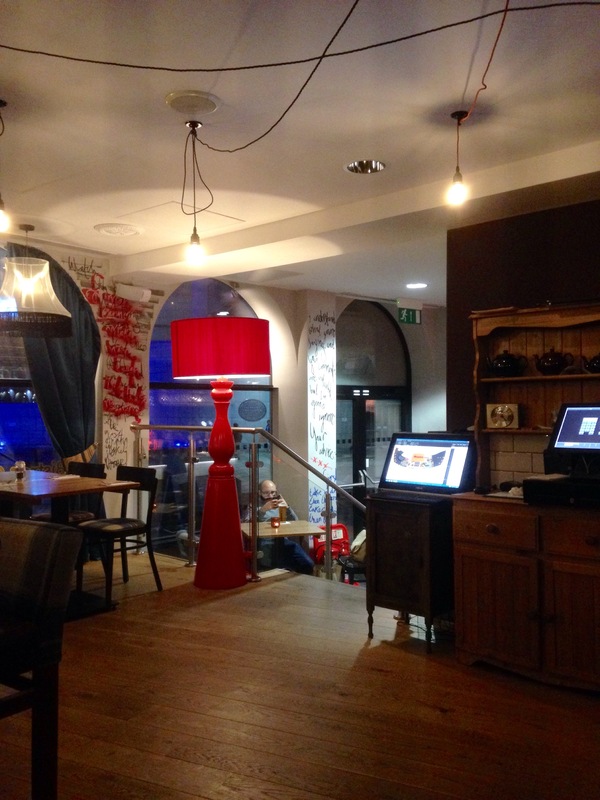 The service was excellent, offering me advice on the menu and the veggie choices, always friendly and relaxed. Ruth loved her omelette, bacon sandwich. Which she’s talked about a lot since, so yes a winner. All the food was cooked fresh to order, and as a cafe, it’s going to get busy as the station and the street with its Midland Metro link outside opens up. Maybe try it before the deluge, for breakfast, lunch, dinner, get in there and spread the word on Grand Central Kitchens reflective air of relaxation and tempting vegetarian food. Our seat at Grand Central Kitchen. 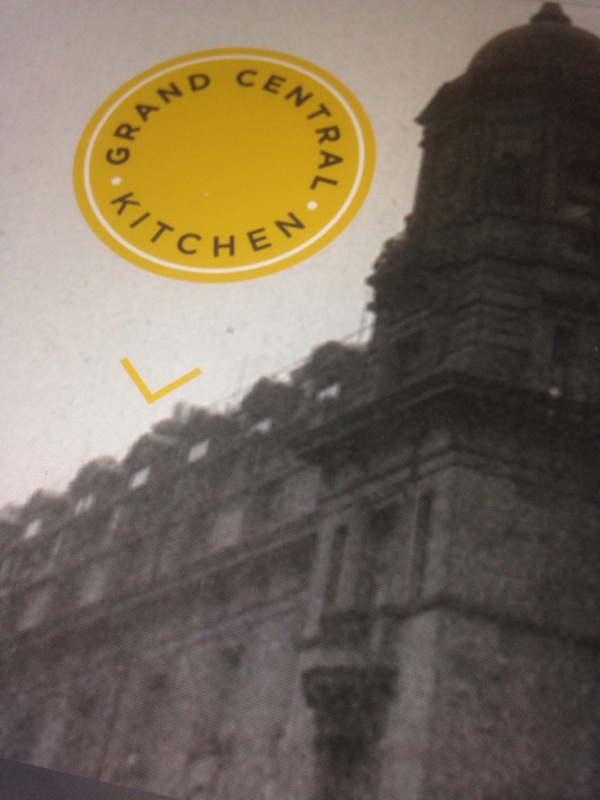 Grand Central Kitchen, 7 Stephenson Street, Birmingham, B2 4BL. Disclaimer: We paid for our own breakfasts and coffee, all opinions are my own, and honest as always. 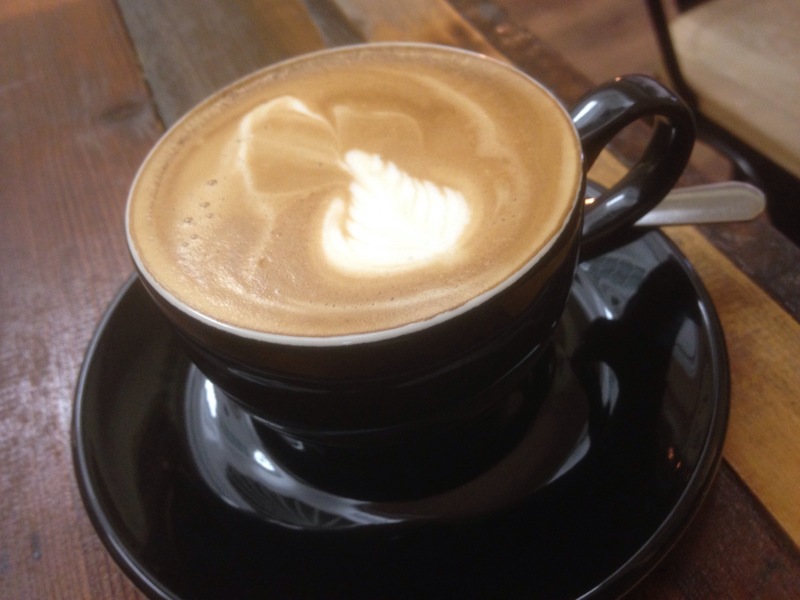 #CoffeeTime: New independent coffee shop openings. It seems that Birmingham City Centre is going independent coffee shop crazy this month with four new openings in and around the centre in the last few weeks. 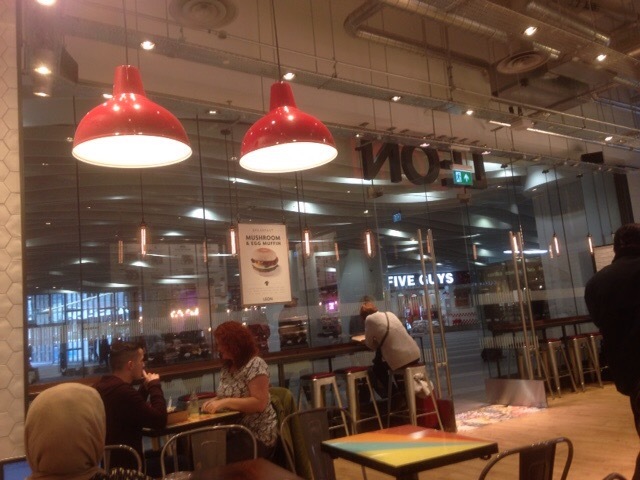 I’ve already mentioned the Six Eight Kafe which has opened at Millenium Point recently which if as popular as their original on Temple Row should do very well indeed and bring a coffee boost to Millenium Point and its eclectic mix. Urban’s new emporium is a smaller affair, but will still be serving brunch, coffee and cake of course. 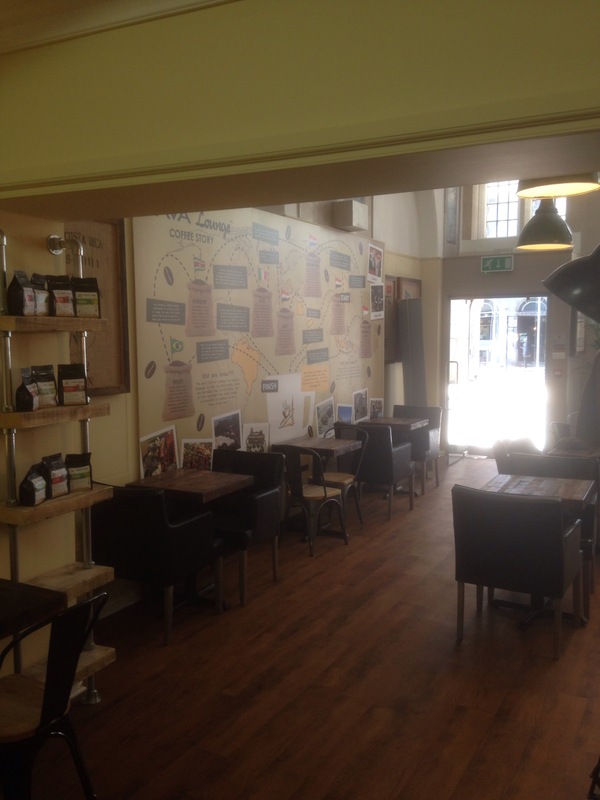 Also recently opened are Quarter Horse Coffee which is an Oxford based coffee shop which is independent and has branched out to Birmingham at 88-90 Bristol Street B5 7AH. @Qtrhorsecofee. Plus the intriguing Diplomat Barista at the 2 SnowHill development near Snow Hill Station. 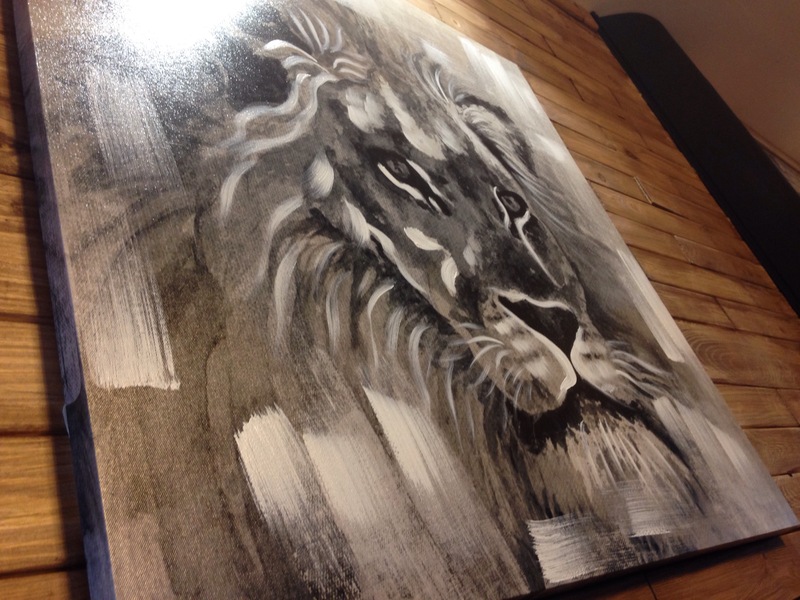 They have a deal with the RBSA Gallery in the Jewellery Quarter to display art on their walls. Looks a good newcomer. 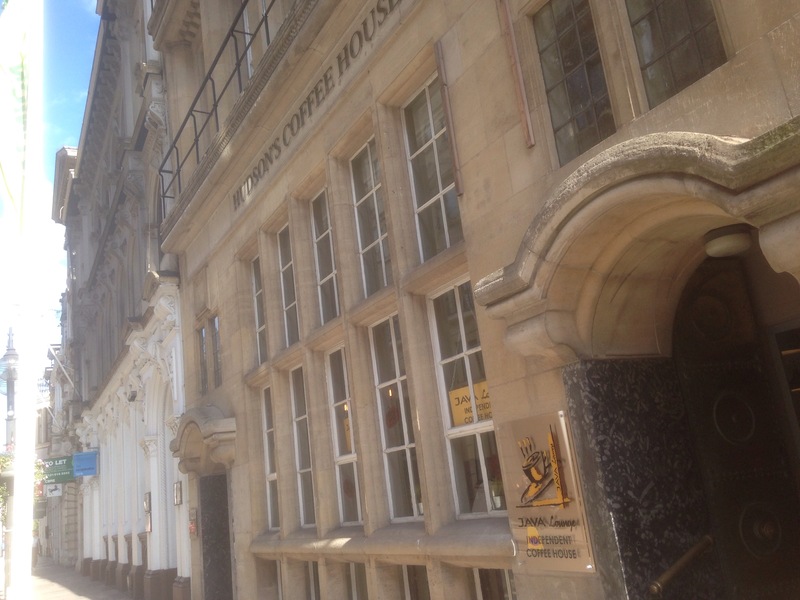 I’ve also heard that Java Lounge from Moseley Village are opening up at some point on Colmore Row in Birmingham City Centre. 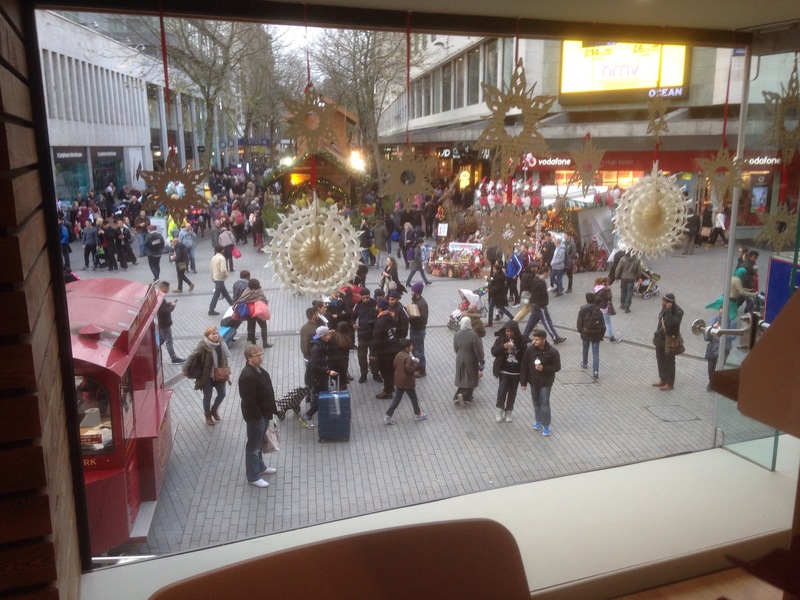 So exciting times for coffee drinkers in central Birmingham. Expect to see reviews and reports on all of these in the next few weeks on my blog. 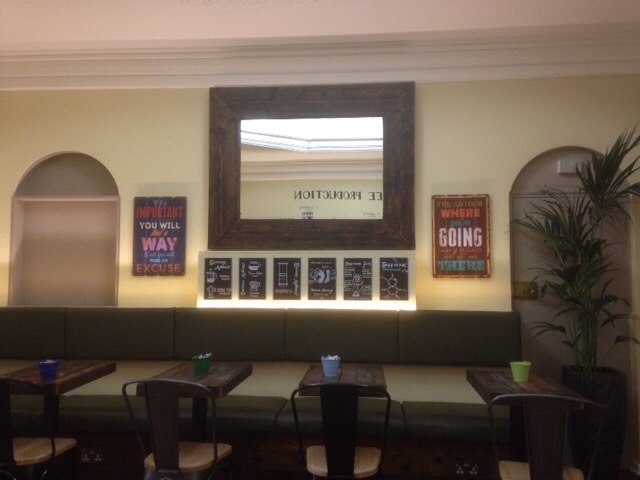 ﻿﻿ ﻿﻿ ﻿﻿ ﻿Photos above taken at Yorks Espresso bar on Colmore Row and Marmalade at Birmingham Rep Theatre. the potential to either be vastly disappointed or underwhelmed by the package presented. 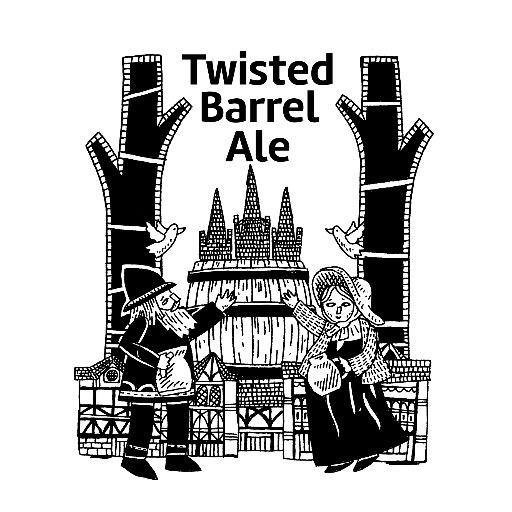 So it was with some trepidation that Ruth and I visited Bitters N’ Twisted’s Marmalade’s in its first week ( its first proper night after a soft launch) seduced by the much trumpeted vegetarian dishes and a bargain 50% off opening week deal. 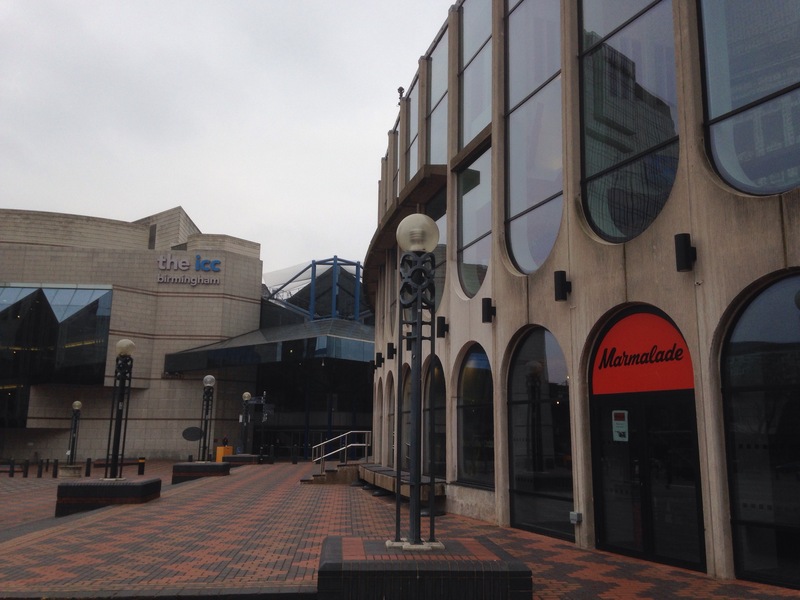 Based at the Birmingham Rep Theatre near the ICC building/Symphony Hall and on Broad Street. On entering we were quietly relieved to see that the old style of theatre dining had disappeared. 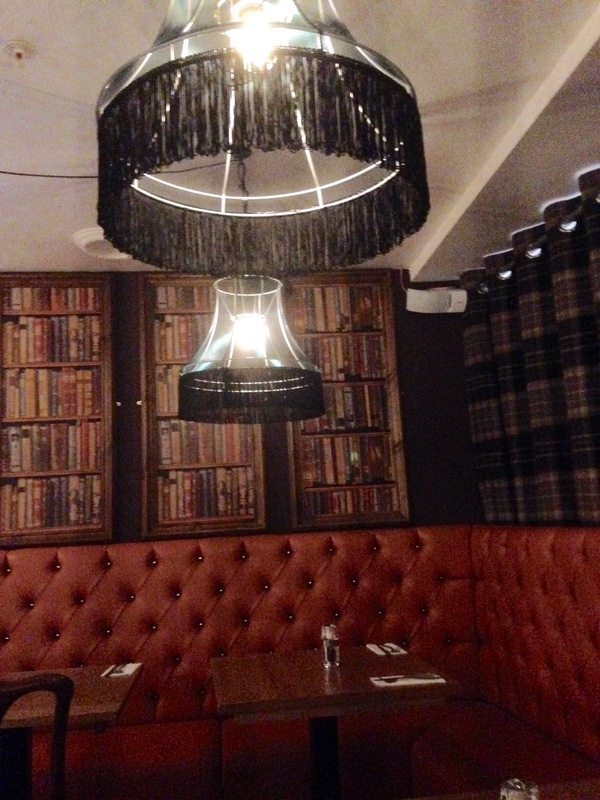 A Nondescript, dull, quietness had been replaced by a modern, funky, wooden, quite cosy feeling space, that had all the hallmarks of other Bitters N Twisted venues. 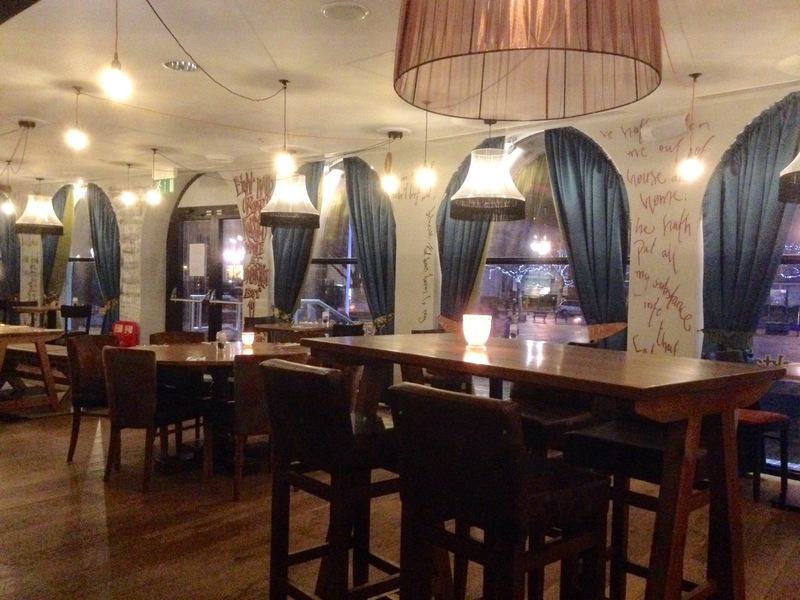 (Bodega, Jekyll and Hyde, Rose Villa Tavern to name just three). I liked the room, long tables, small tables, good lighting, large windows, a bit like Bodega, but unique too the brand too. 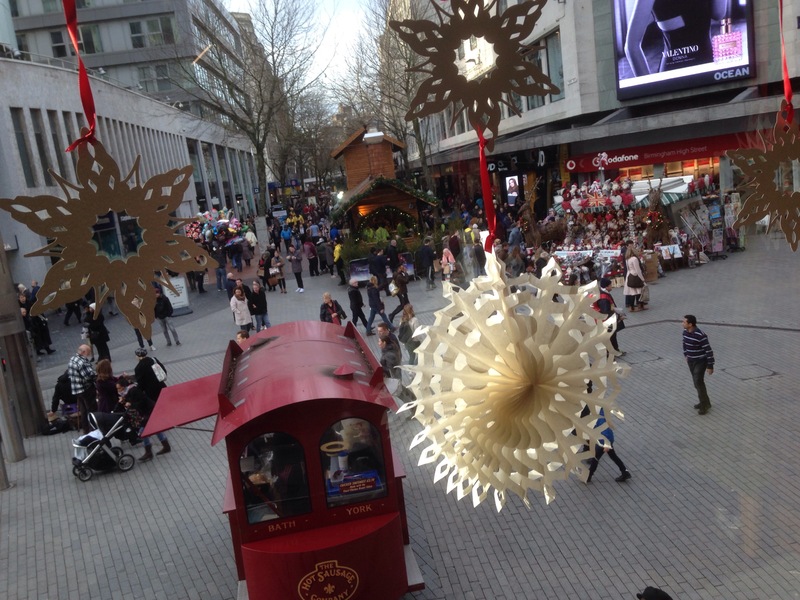 It had potential to be buzzy when busy. The Bistro was quite busy when we got there, though the pre theatre guests would be engrossed in their play and the night was quite cold. We were seated in a cosy corner and perished the menu. Service initially was quite slow, but generally improved as the night went on. Though it felt decidedly chilly and without a personable touch, more functional with little enthusiasm compared with say Bodega. Not fitting for a restaurant in its opening days, where you may expect that touch. One must not grumble though, it’s early days, and this is something to work on. We ordered a couple of drinks. 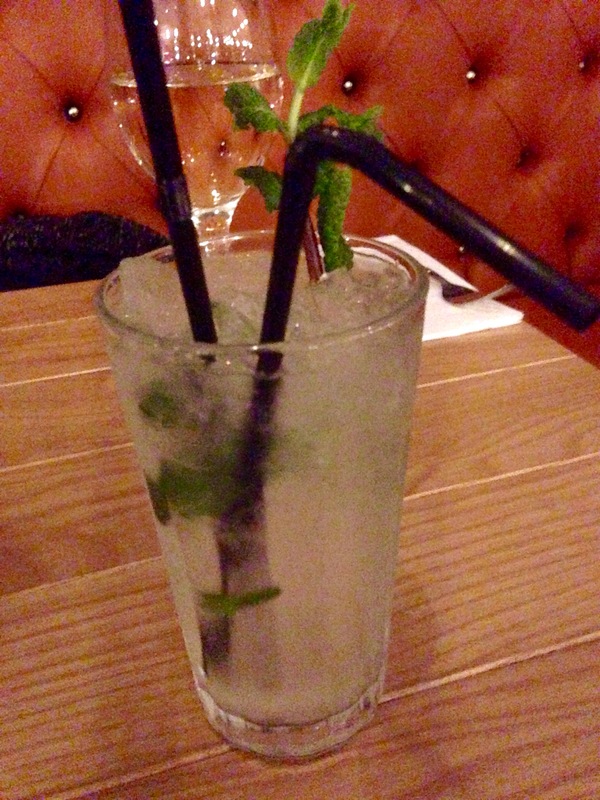 Ruth a white wine me a Mojito. My cocktail was good, a good touch of rum, refreshing, sweet, what you would expect. 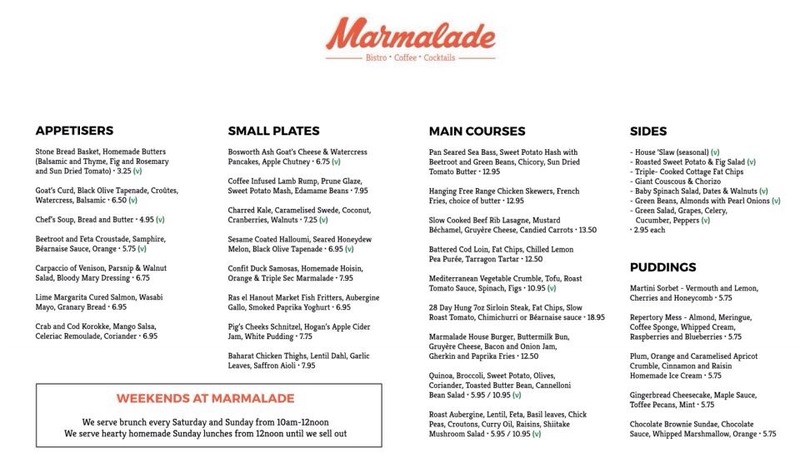 We decided to order one of Marmalade’s small plate options to share along with some bread. We ordered the stone bread basket, homemade butters (Balsamic and Thyme, Fig and Rosemary, and sun dried tomato) plus the Charred Kale, caramelised swede, coconut, cranberries, walnuts. The bread we felt wasn’t as fresh as it could have been. It was ok. The butters didn’t taste of any ingredients in the description and were disappointing as we were looking foreword to trying them. Great idea though. 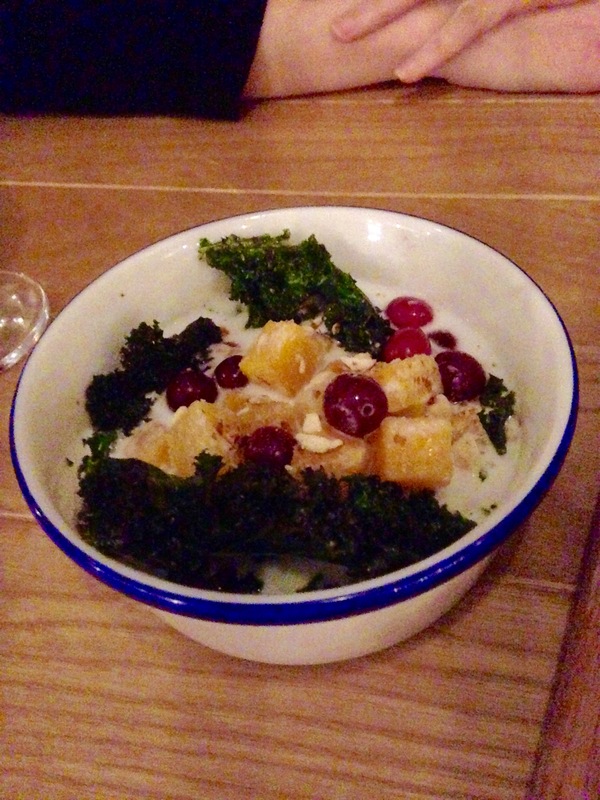 The Kale dish looked impressive, pretty on the plate. It was delicious, the crunch of the kale against the soft swede and blended into a coconut sauce felt quite Thai or Malaysian, subtly spiced and a good plate of food, and with the bread for dipping into the creamy coconut a good mix. 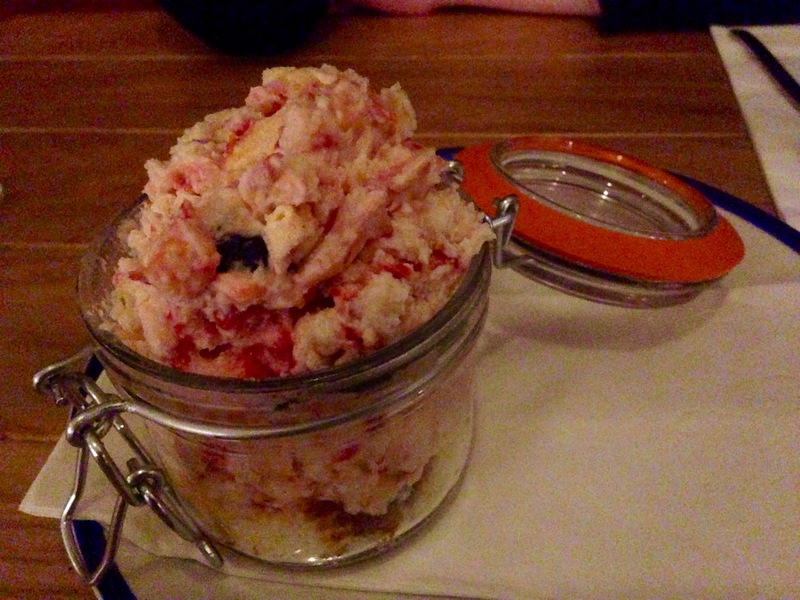 For £7.25 good value shared with another sharing plate dish as a taster. 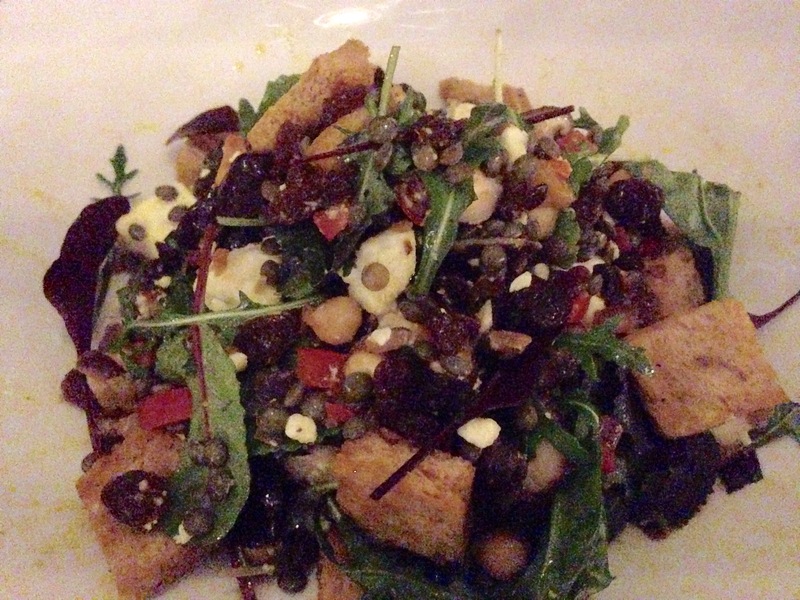 Leaves, chick peas, croutons, curry oil, raisins, shiitake mushrooms salad. (A long title). Which when it arrived didn’t look anything like the press release photographs, but was covered in rocket/salad which his the beautiful bright colours of the chick peas, lentils and aubergine, as if it was embarrassed by them. Shame. It was that presentation that grabbed me. On the whole though the taste of the dish was very good. Lovely flavours running through it, it felt healthy, warming, the chick peas, lentils, mushrooms and aubergine gave it a bite and vitality and with the toasted croutons made for a filling warm salad. I enjoyed it. It would make a good starter (and is available as such) promising and with two other vegetarian main dishes plenty to return to, including a lovely sounding vegetable crumble with tofu. 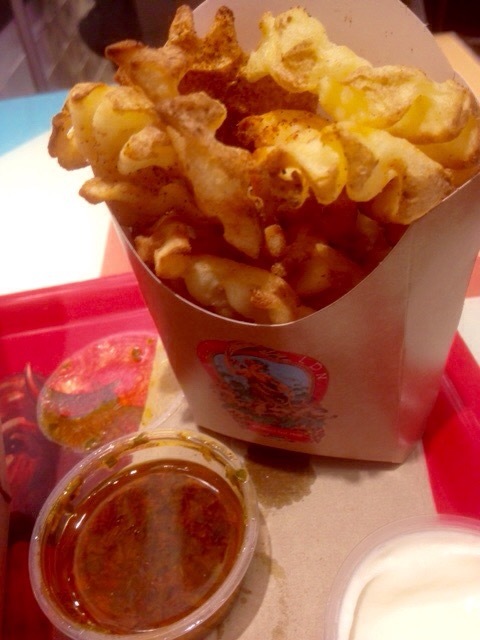 We also ordered a good side portion of chips which were good. Ruth ordered cod fish and chips which was she said ok, cooked well but a bit bland and unseasoned, and served with a small portion of chips, hence the extra portion ordered. For desert we decided to share the brilliant sounding Repertory Mess- almond meringue, coffee sponge, whipped cream, raspberries, and blue berries. 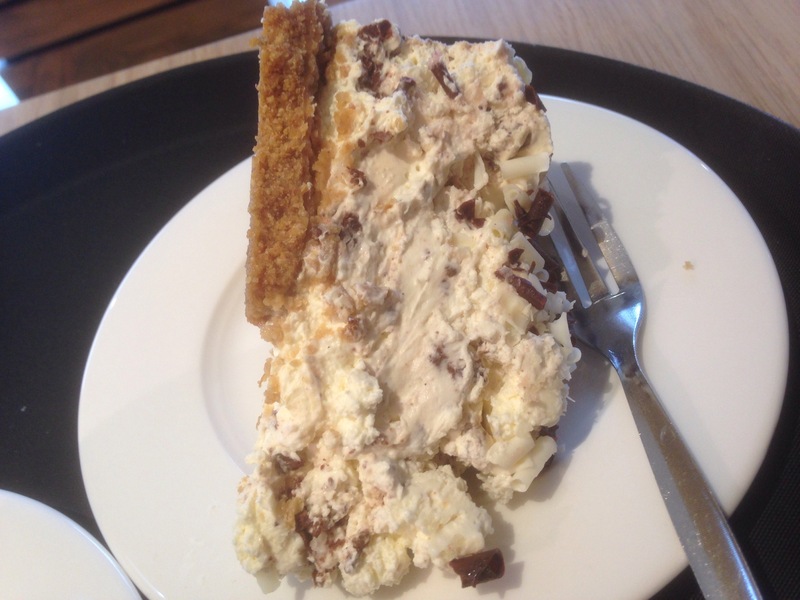 It was ok, good in fact until we came across (about half way down) the cloying and overpowering coffee soaked sponge, and then a good mess became a tiramisu, a bit confused, we liked half of the pudding, but was left with an after taste of coffee not fruit and meringue. A shame. So on the whole Marmalade was a good experience. It has massive potential. 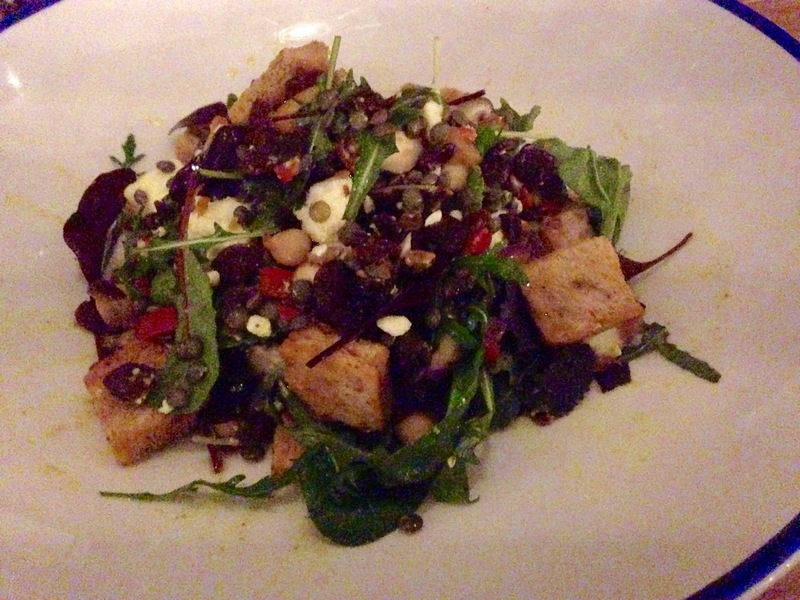 Credit is deserved and due for the varied and from what I tasted good vegetarian dishes. A lot of work has been put into them and thinking of us veggies as an important diner. They show a progression and trend for a varied tastes, textures, and ingredients. Yet, maybe a curates egg on the day I visited. The service was only ok, no one checked whether we enjoyed the food, no one checked how the veggie dishes were, no market research, not a great deal of enthusiasm but always polite. 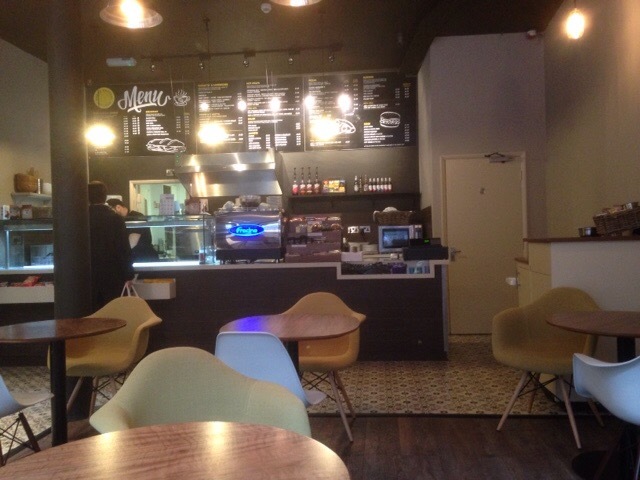 I liked the space though, the decor, lighting and potential and I did return to enjoy a fine flat white the next day in the bar, and service there was much better. So maybe a return visit in a few months, once things have settled down. 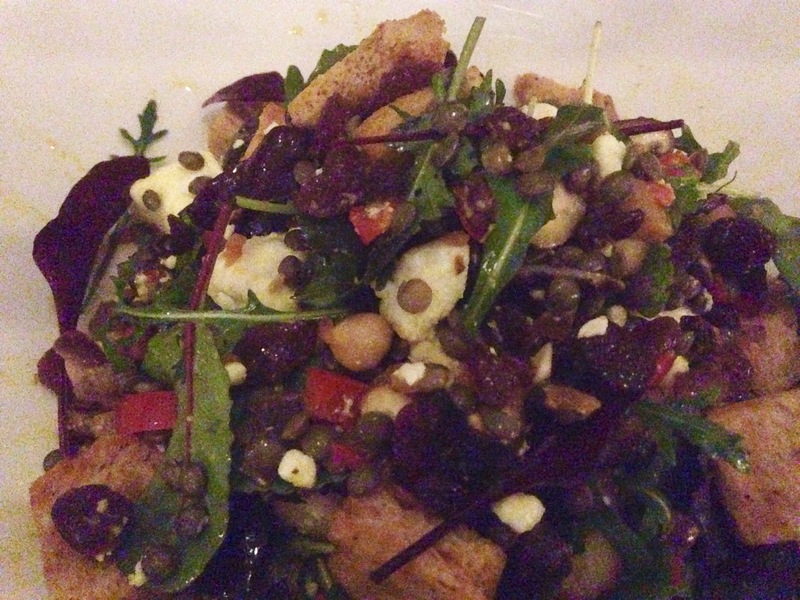 Those veggie dishes deserve to be discovered. Theirs lots to like about Marmalade, the cocktails, the varied and imaginative menu, the pre theatre deal, and there’s some things to work on. 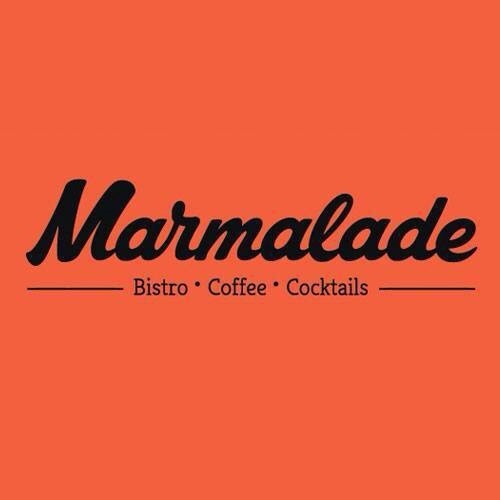 We ate at Marmalade with 50% off the bill. The other 50% we paid for. My opinions are my own, honest as always. 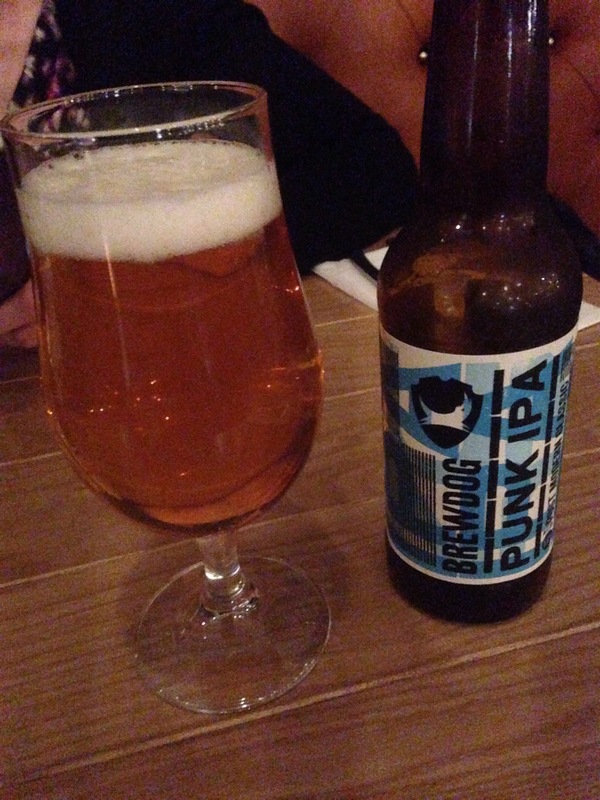 I also drunk a delicious Brew Dog Punk IPA. Part of a good selection of craft beers on offer at Marmalade.